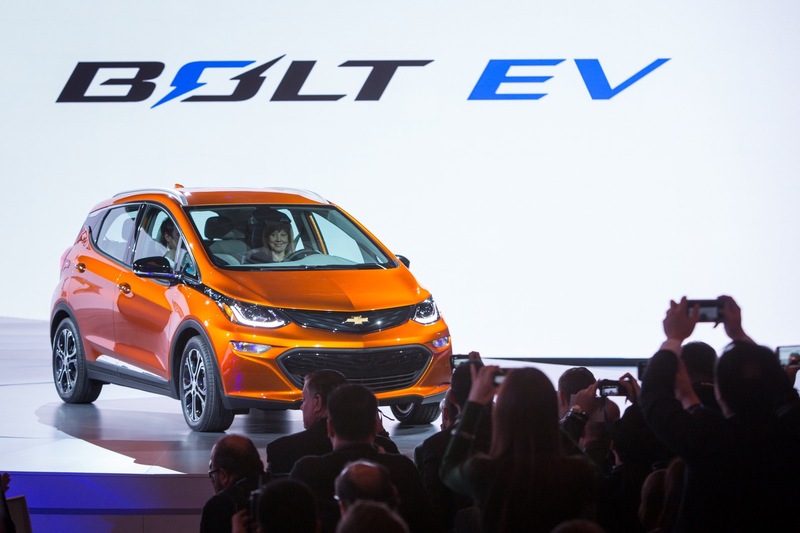 The 2017 Bolt EV is a battery-electric vehicle (BEV) from General Motors’ Chevrolet brand. 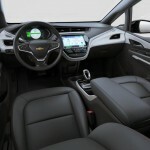 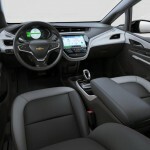 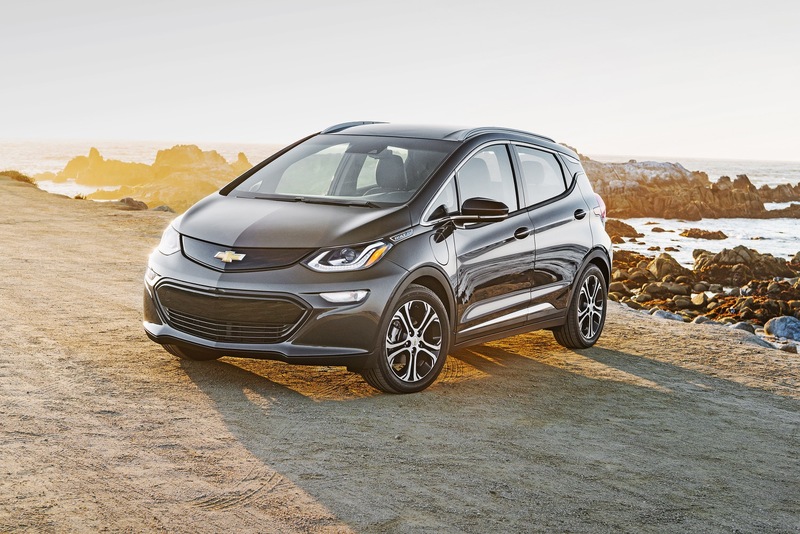 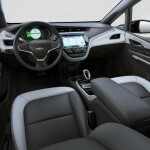 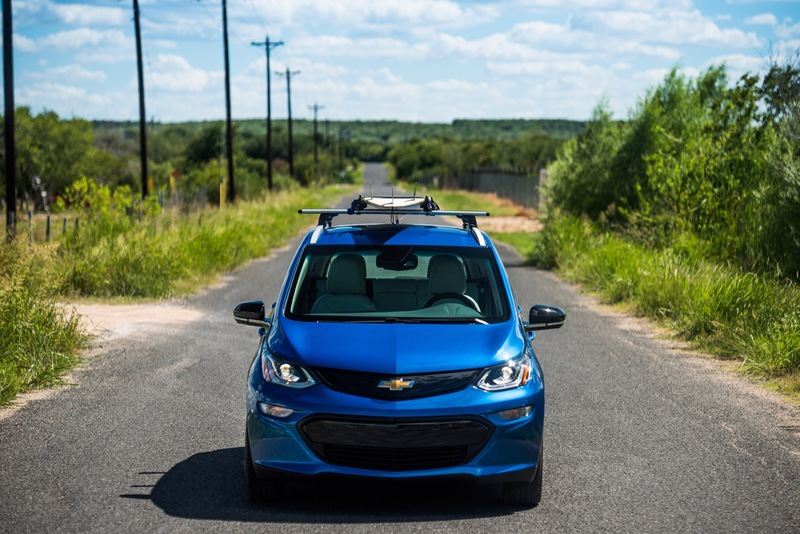 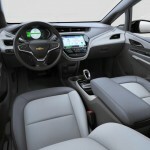 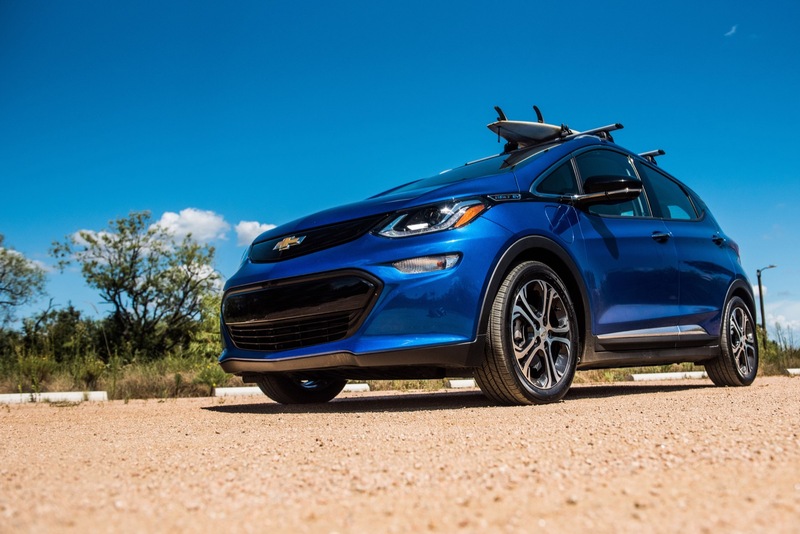 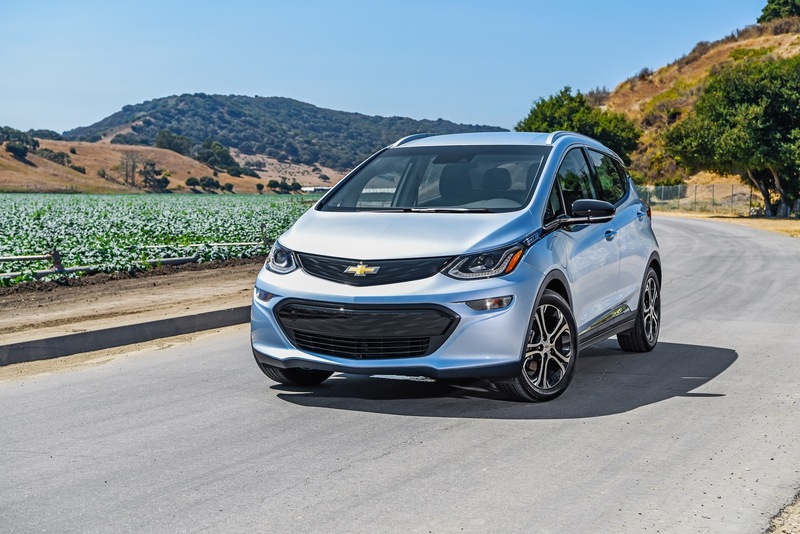 Officially positioned as a crossover by Chevrolet, the five-door subcompact hatchback will offer over 200 miles of range on a full charge while also featuring advanced connectivity technologies designed to enhance and personalize the driving experience. 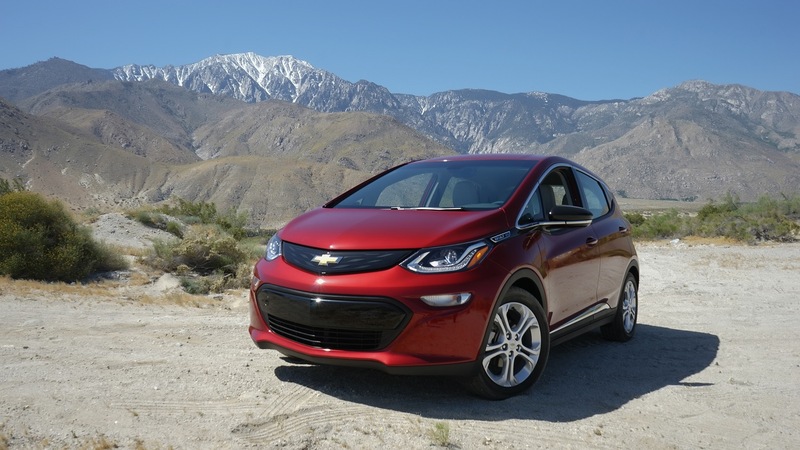 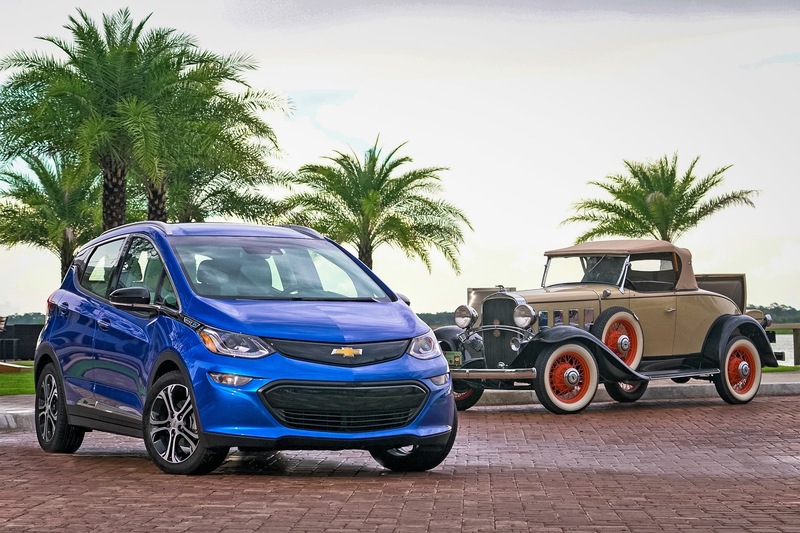 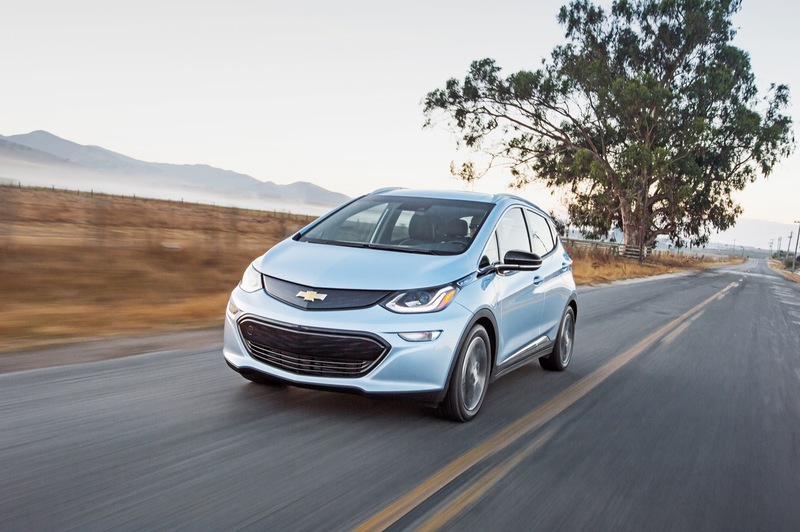 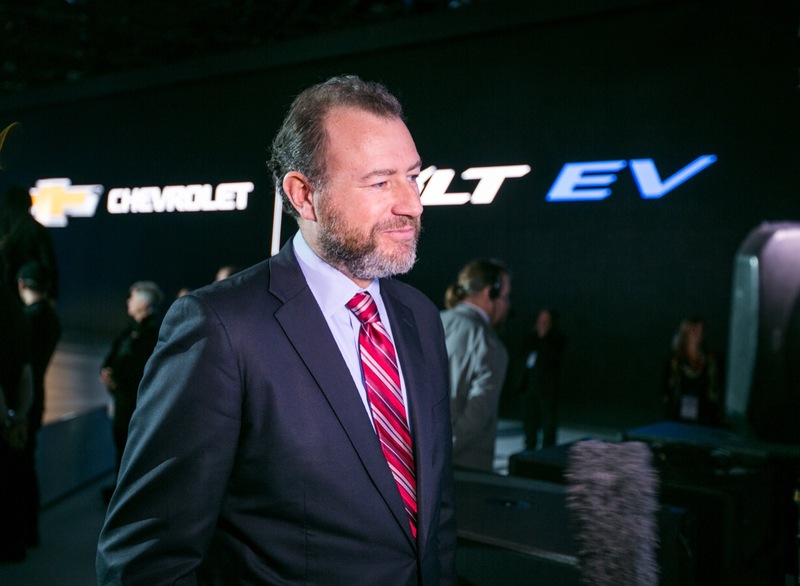 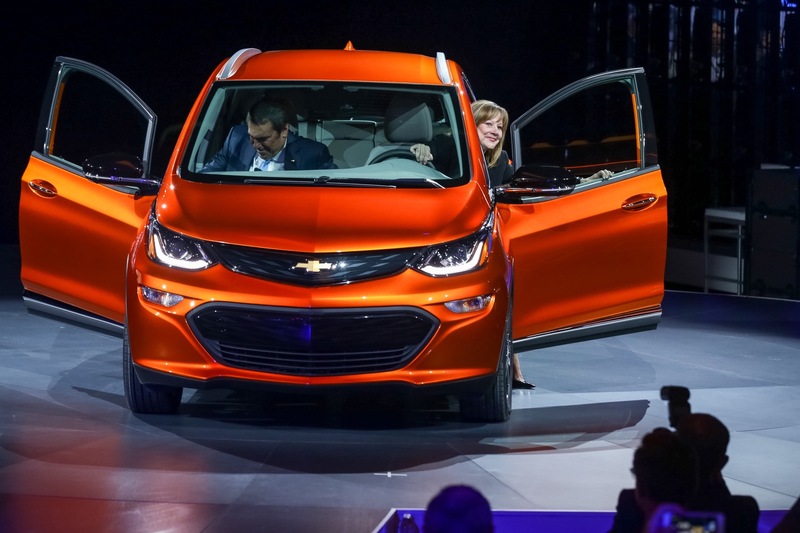 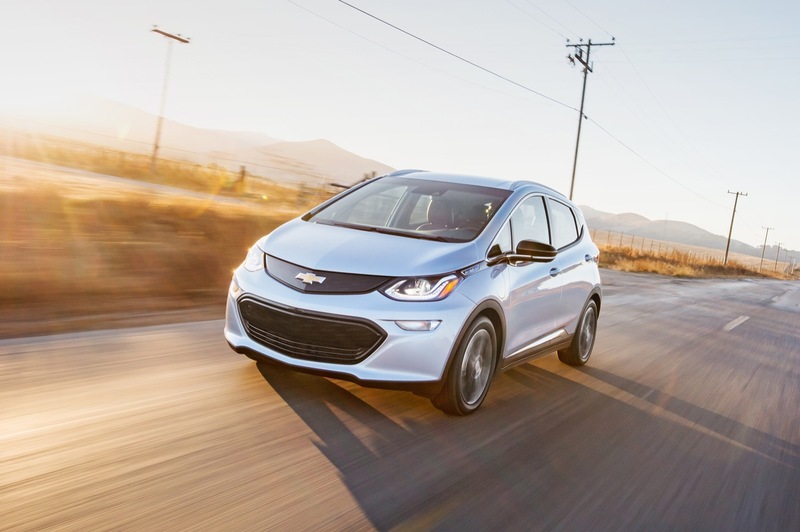 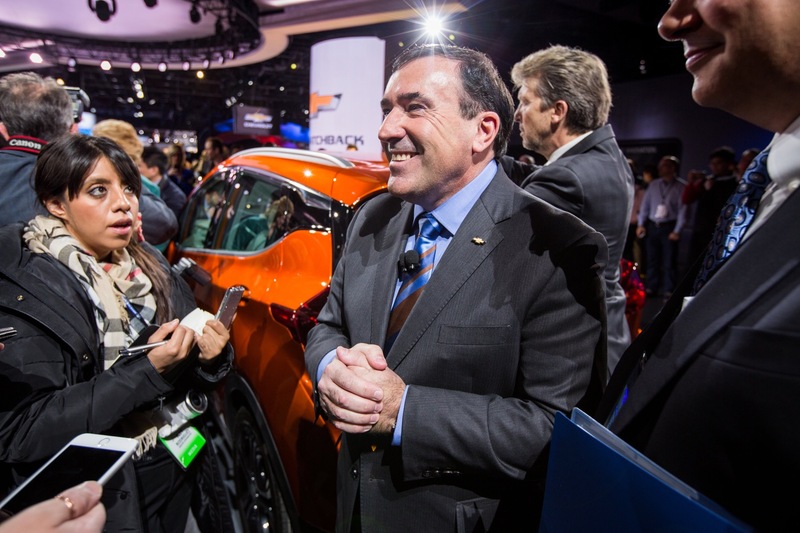 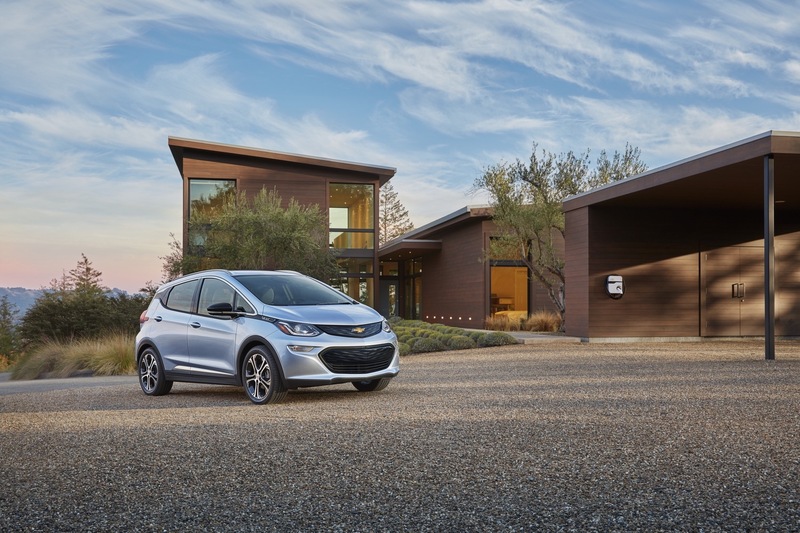 In introducing the 2017 Bolt EV, Chevrolet has delivered on its promise to bring an electric vehicle “to the masses”. 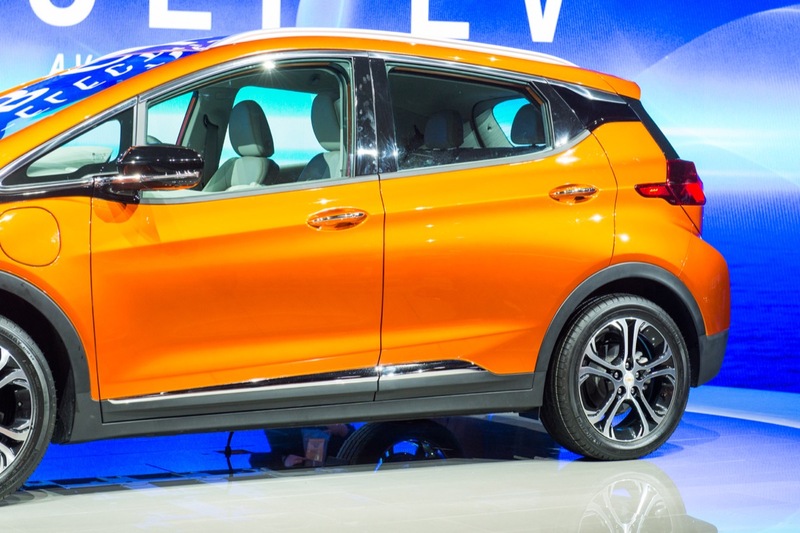 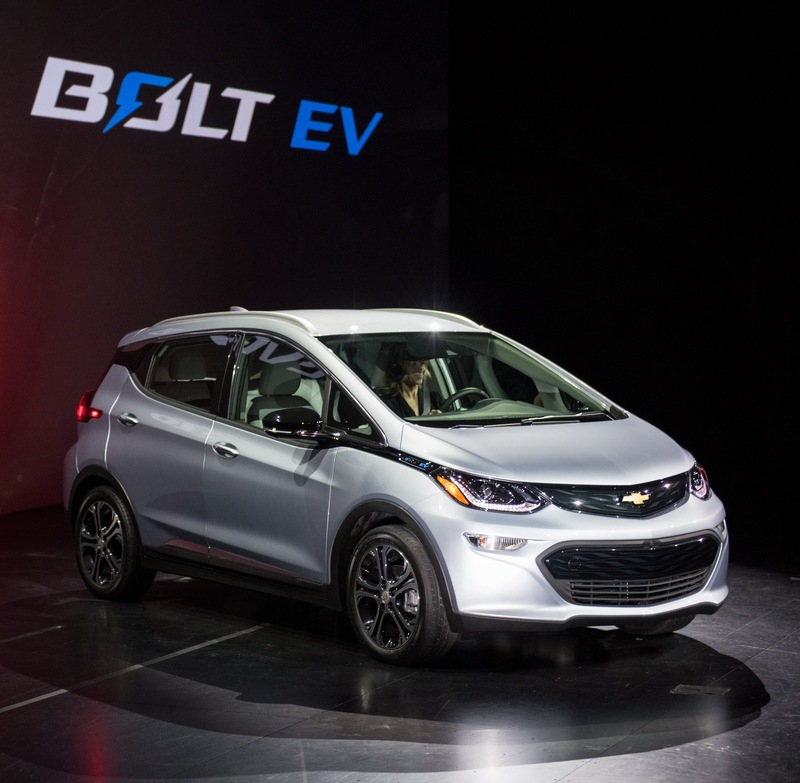 The 2017 Bolt EV exterior features the latest Chevrolet design cues. 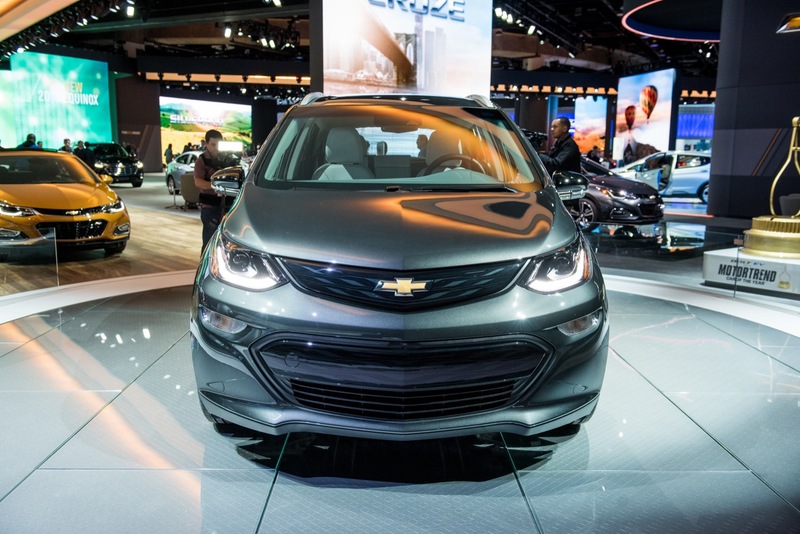 The front end features a dual-port grille, HID projector beam headlights with LED accent lighting, and a large, swept-back windshield. 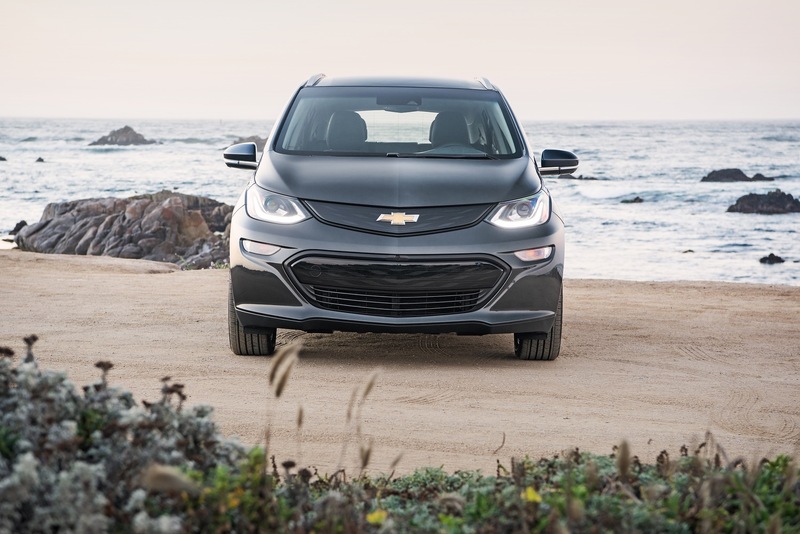 The grille on the 2017 Bolt EV is available in two different colors – Dark Silver and Black. 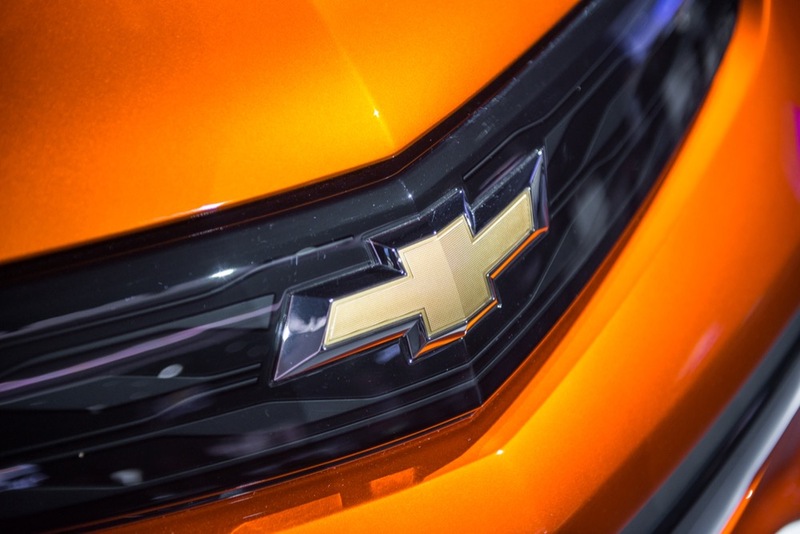 The grilles feature the Chevrolet bow tie logo. 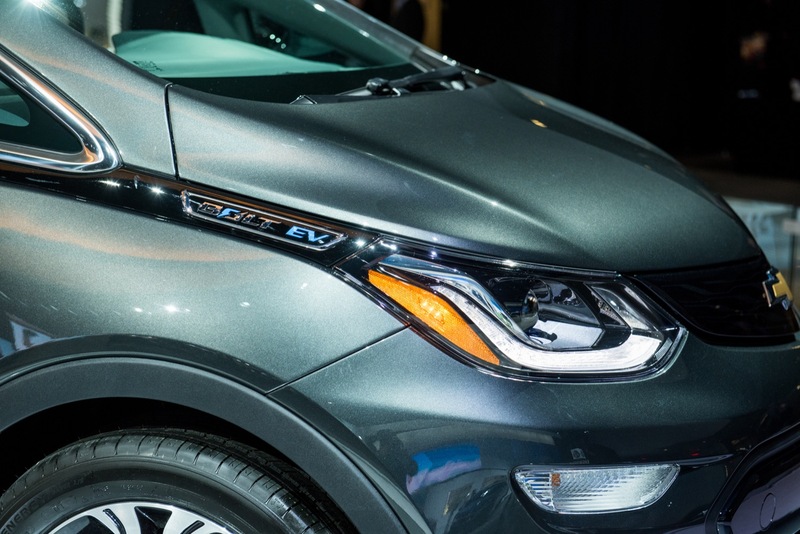 But compared to a traditional vehicle grille, both grilles are mostly “closed off” – since the Bolt has different powertrain cooling requirements over a regular vehicle with an internal combustion engine. 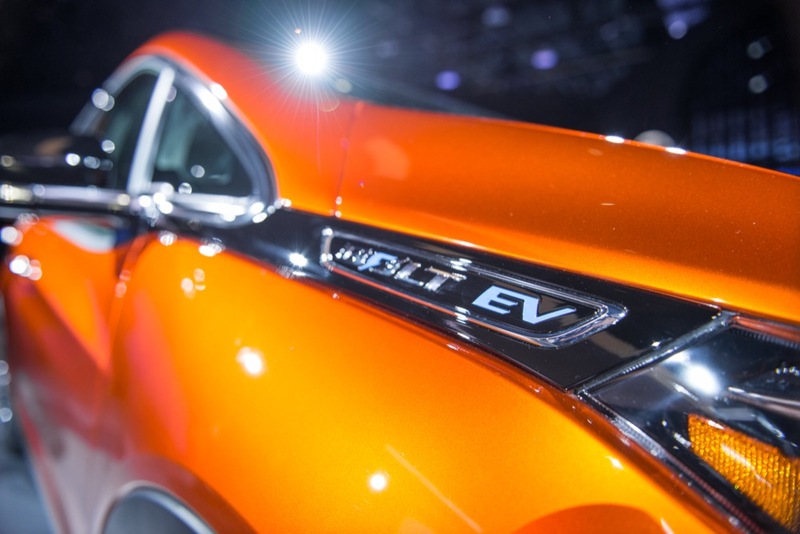 Closing off the grilles is part of the Bolt EV’s aerodynamic properties. 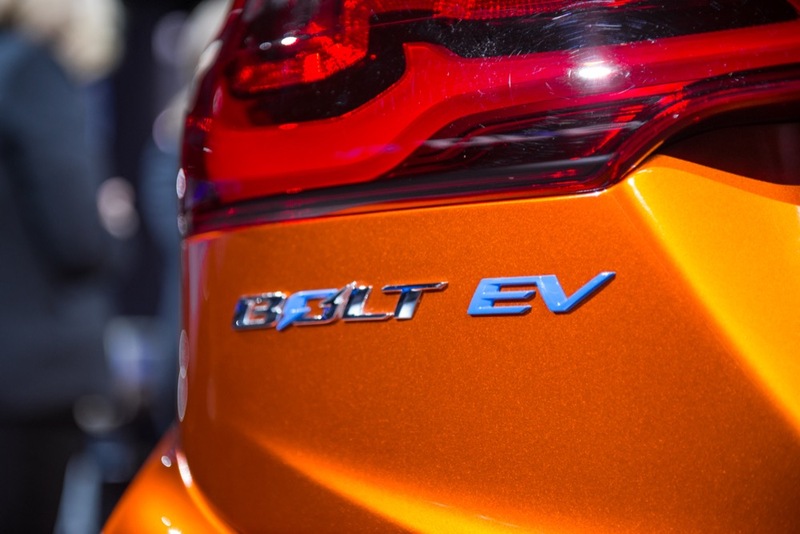 On the side, the Bolt EV features an inscription just aft of the headlight. 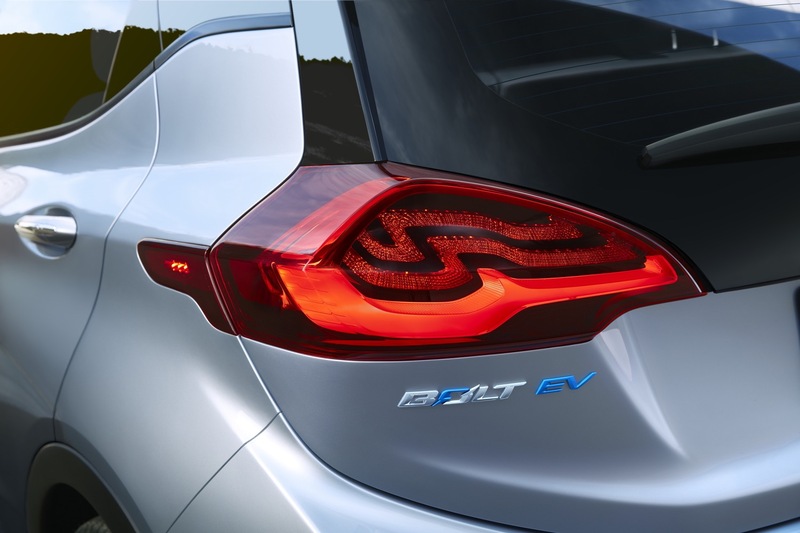 Below it on the driver’s side resides the charge port door. 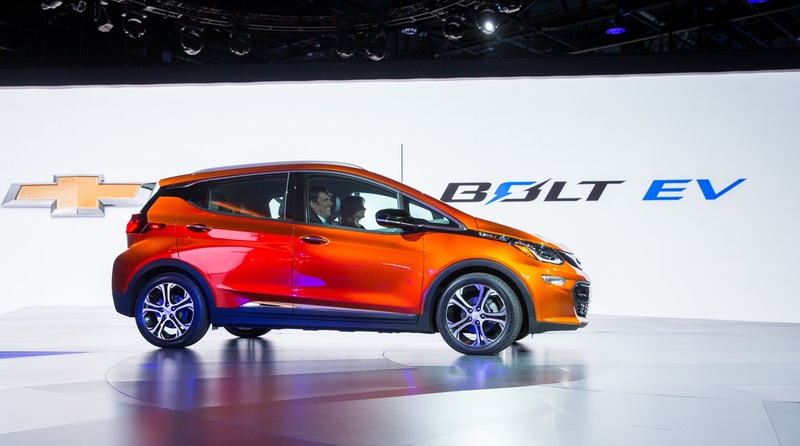 Bucking the modern trend of attaching the wing mirror to the door, the Bolt’s wing mirrors are instead attached at the belt line via a thin stem. 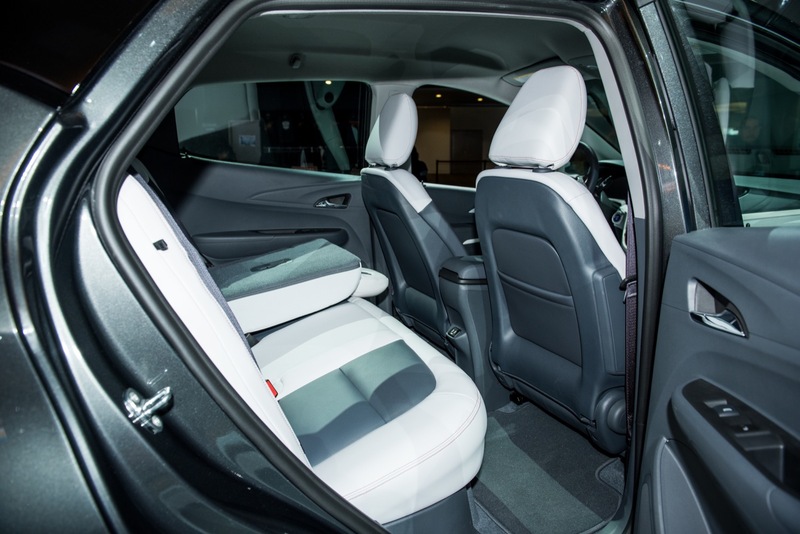 Thanks to a belt line that starts low in the front and sweeps up towards the rear, as well as a roofline that inverts the movements of the belt line, the driver and front passenger are treated to expansive glass area with a large front vanity window. 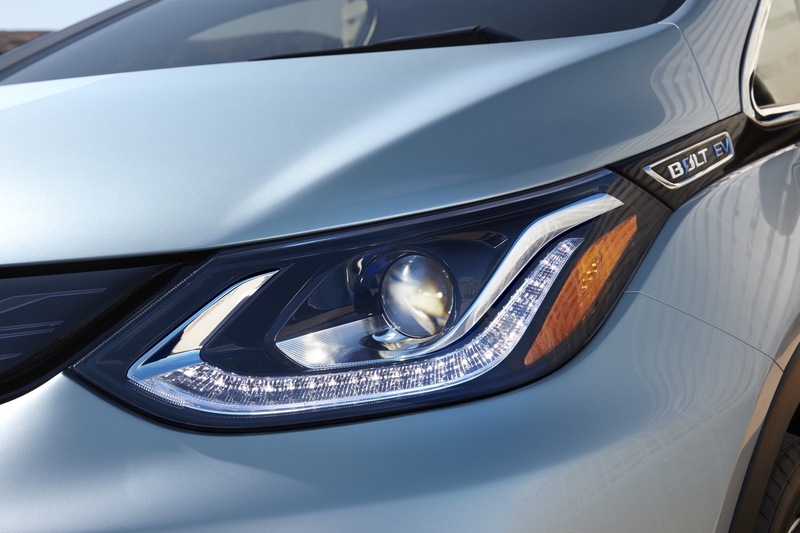 The DLO, or Day Light Opening space, is trimmed in bright chrome. 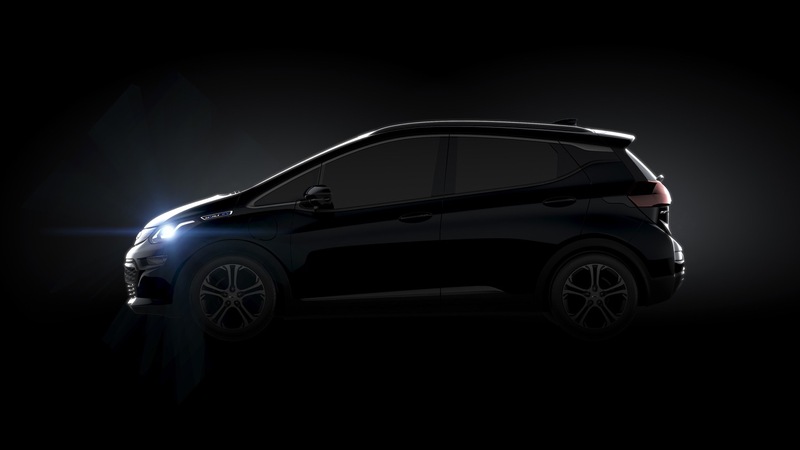 The roofline and belt line merge together as they approach the C pillar, which features a piano black finish. 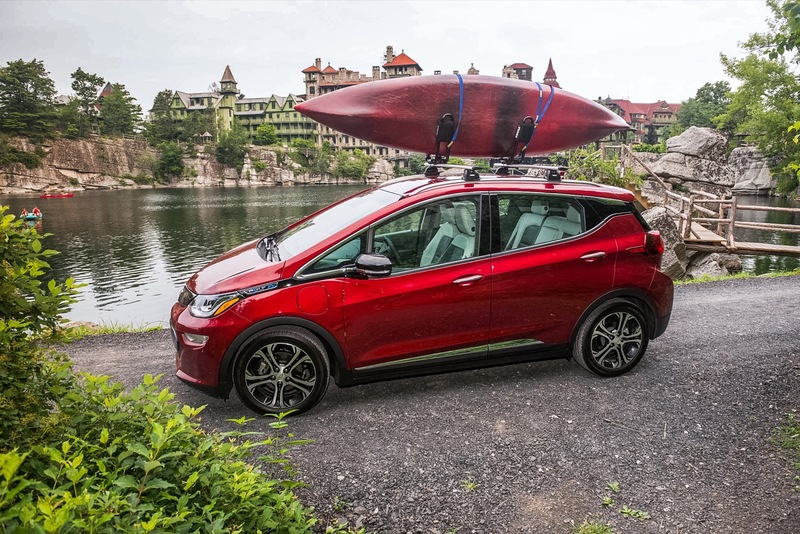 The roof features roof rails running the length of the roof, capable of accommodating roof racks to carry bikes, skis/snowboards, surf boards and cargo boxes. 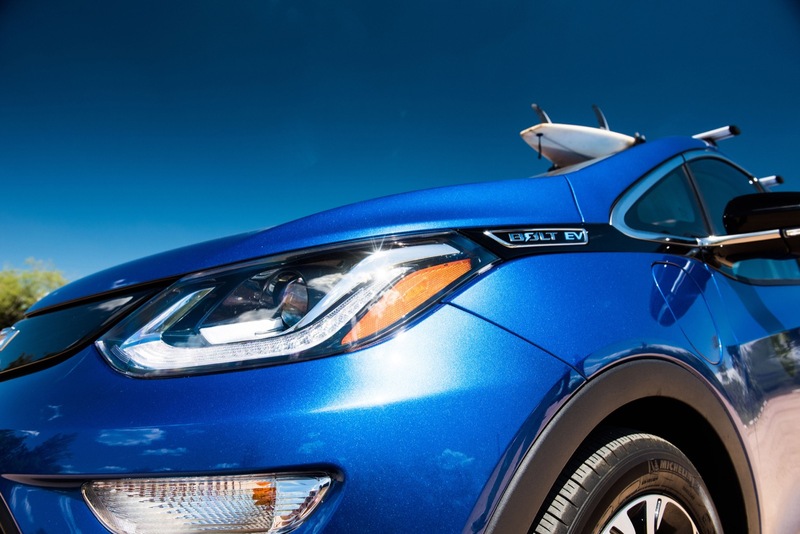 A shark fin-style antenna is positioned at the center of the rear-most point of the roof. 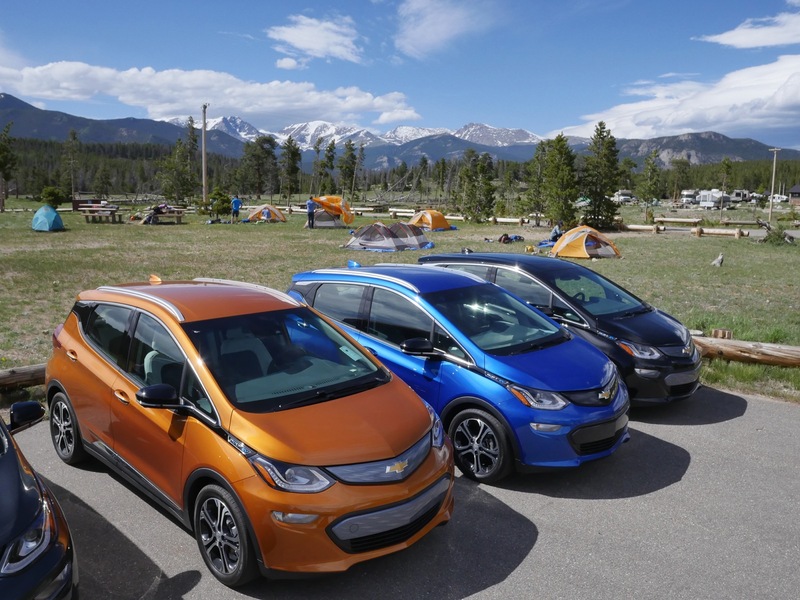 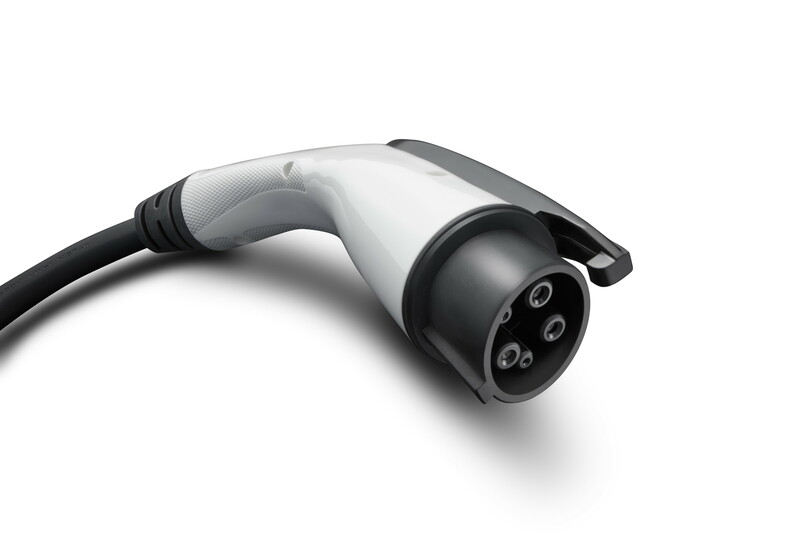 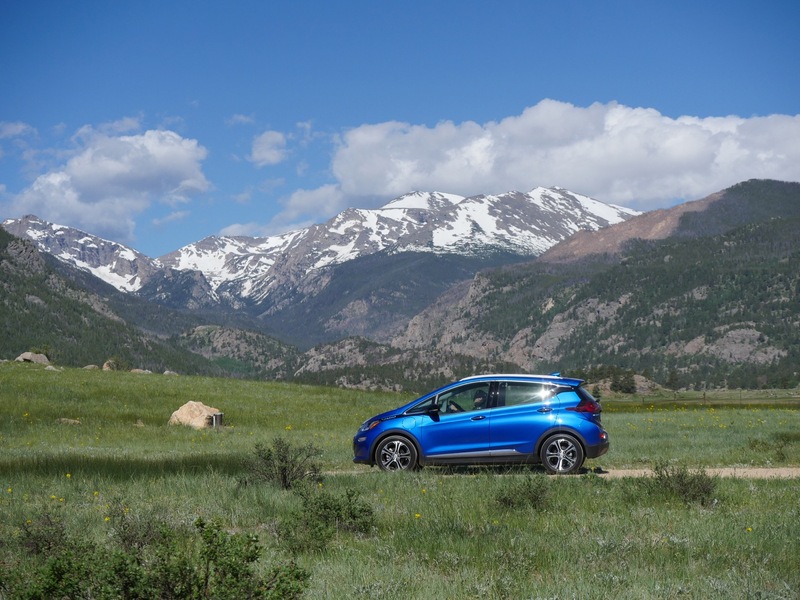 Two 17-inch (43.2 cm) wheel choices are available: a painted aluminum set standard on the Bolt EV LT, and an ultra-bright machined aluminum set with painted pockets on the Bolt EV Premier. 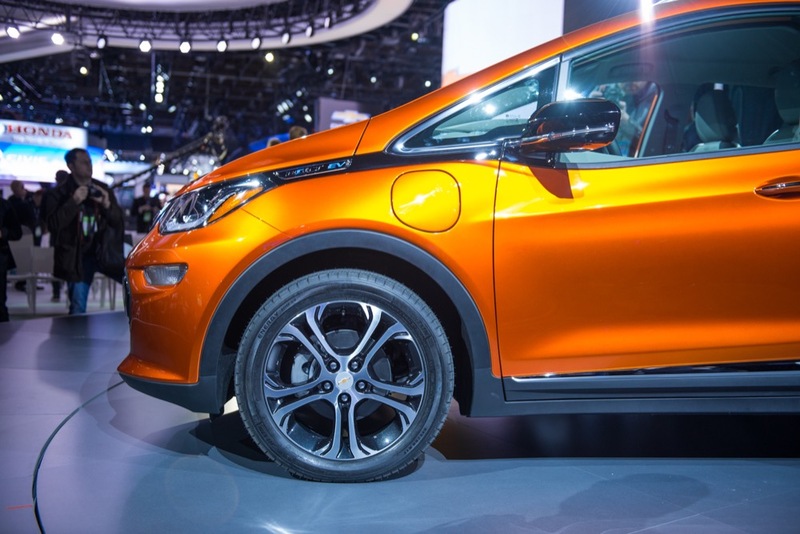 The wheels are wrapped in Michelin Selfseal all-season, run-flat tires sized P215/50R17. 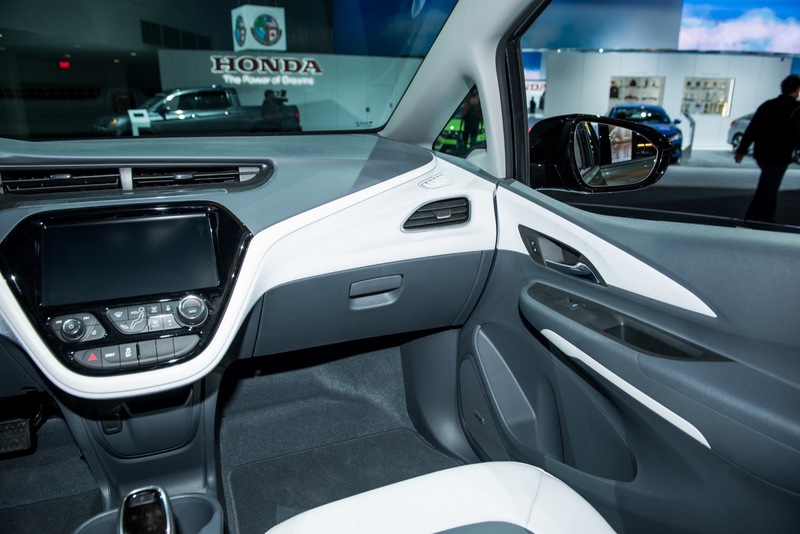 The door pull handles are positioned at different heights, with the front units being lower than those in the rear. 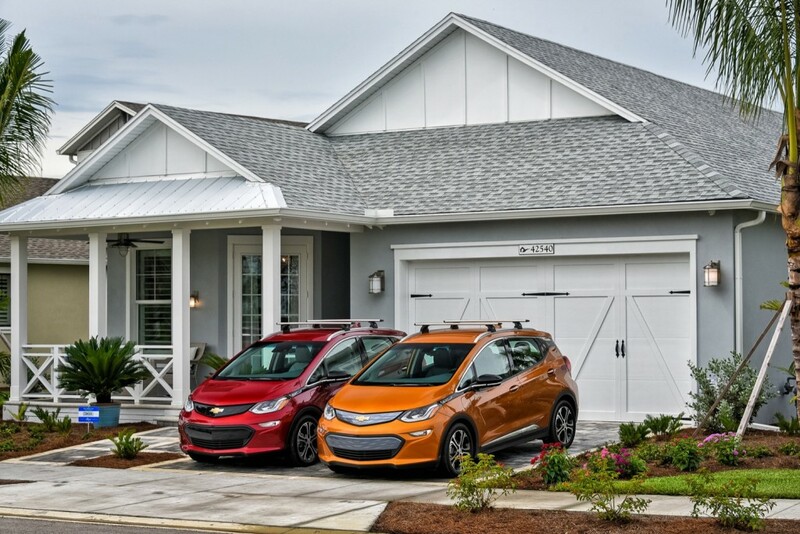 The doors feature several character lines. 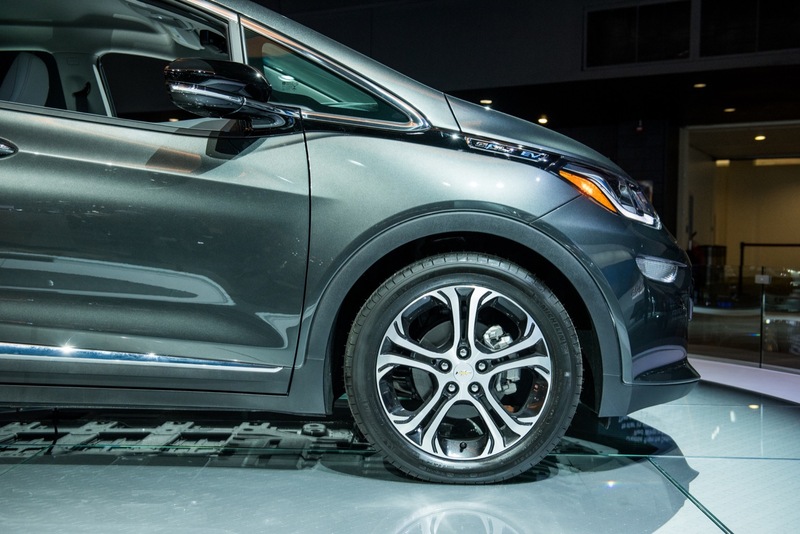 The lowest portion of the doors features a bright accent that starts at the front and spans roughly half of the rear door. At the rear, the 2017 Bolt EV features a tailgate-mounted rear spoiler that assists in aerodynamic qualities. 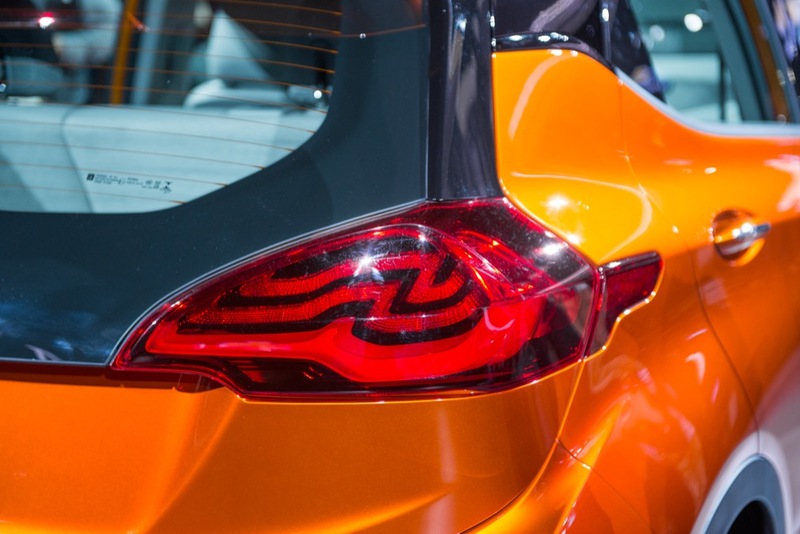 The spoiler runs horizontally, but also features a two piano black vertical elements that appear to be part of the C-pillar, but are part of the spoiler instead. 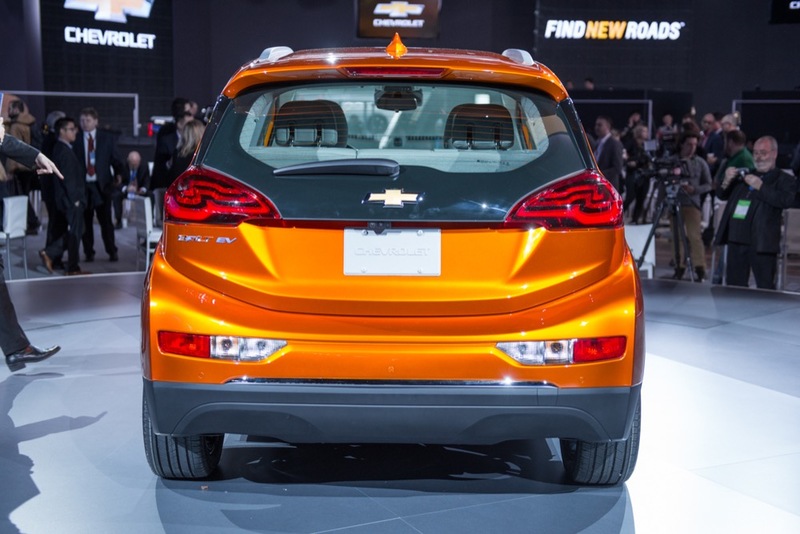 Two red LED taillamps flank a centrally-positioned Chevrolet bow tie logo. 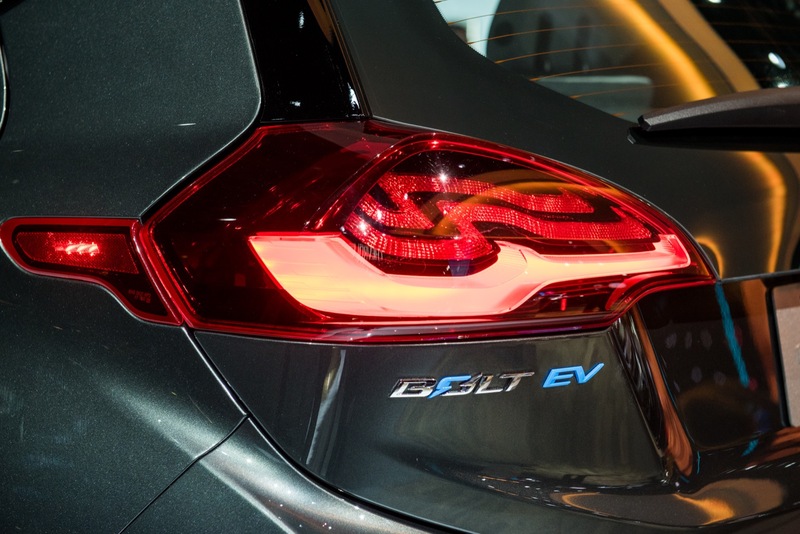 The taillamps are connected to light reflectors placed on the side of the vehicle, aft of the taillamps. 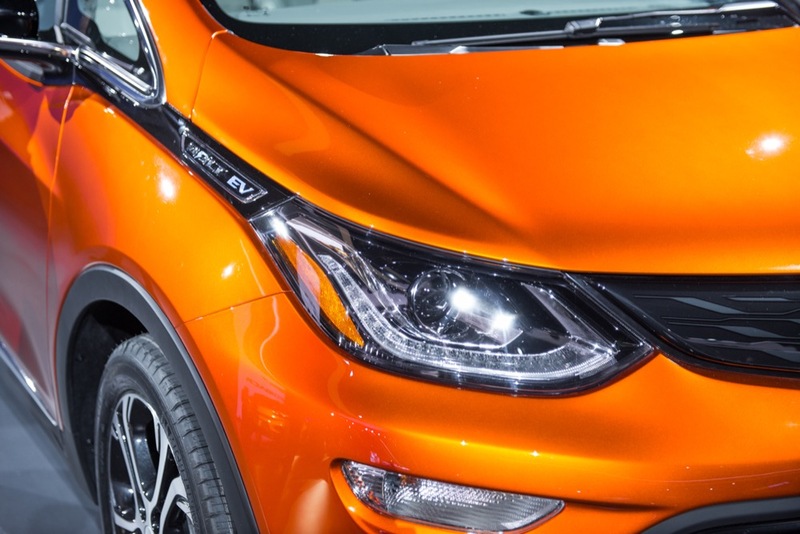 The lower facia contains two red light reflectors and two clear reverse lamps. 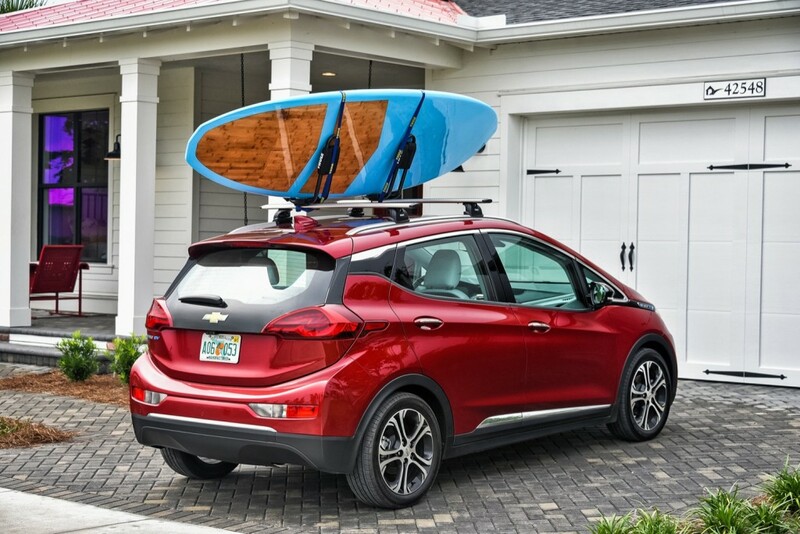 The vehicle features a large, top-hinged tailgate/hatch. 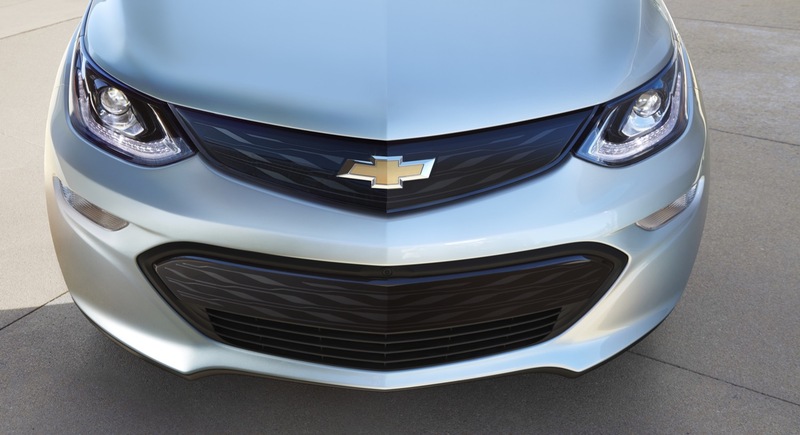 Black plastic cladding spans the lower portion of the vehicle, starting at the lower end of the front bumper cover, around the wheel wells, along the side, and into the rear bumper cover. 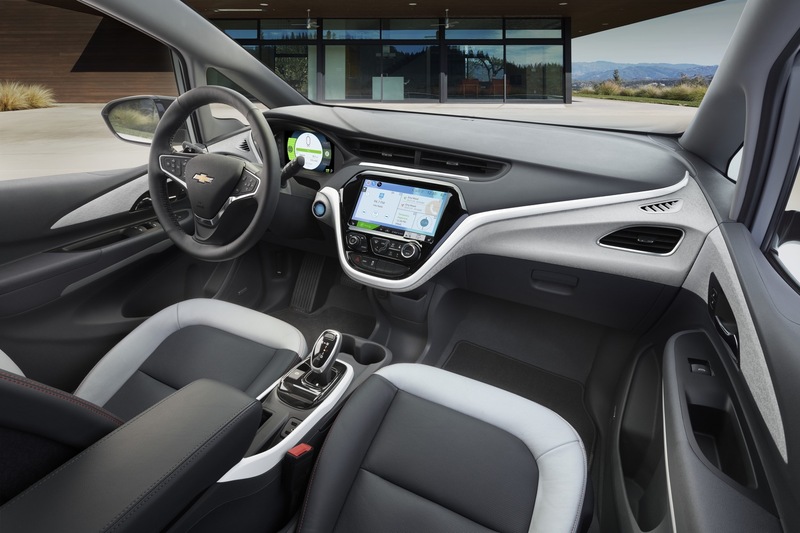 The 2017 Bolt EV interior showcases some of Chevrolet’s latest technologies in a mainstream, affordable package. 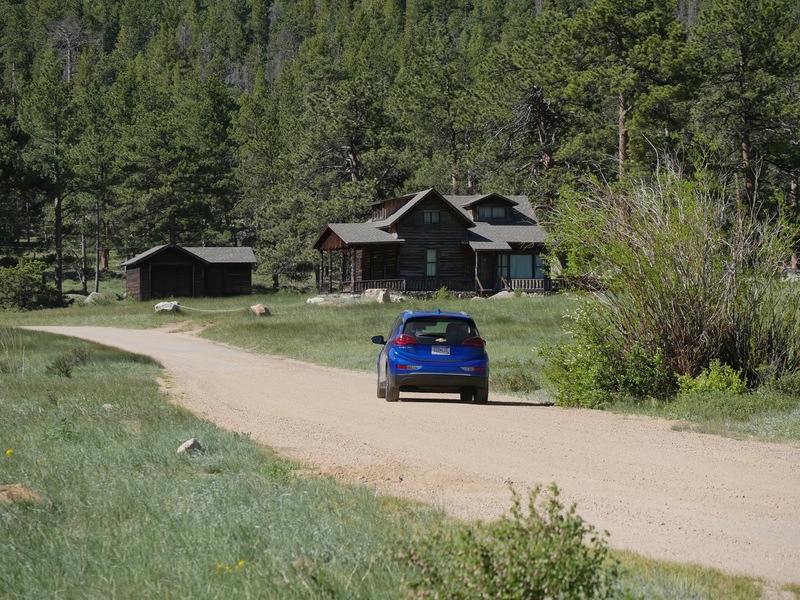 The cabin is defined by great outward visibility from the front and the sides. A big and expansive windshield, big front vanity windows and large side glass for the driver and front passenger create an air of spaciousness. The big side glass is enabled by a belt line that swoops down in the front and then rises gradually toward the rear. 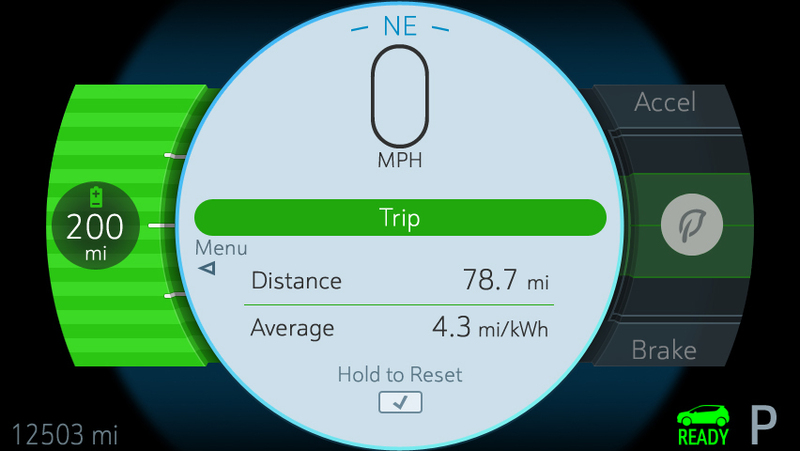 The dashboard is mostly flat at the top and features a V-shape, with the infotainment screen forming the bottom portion of the “V”. 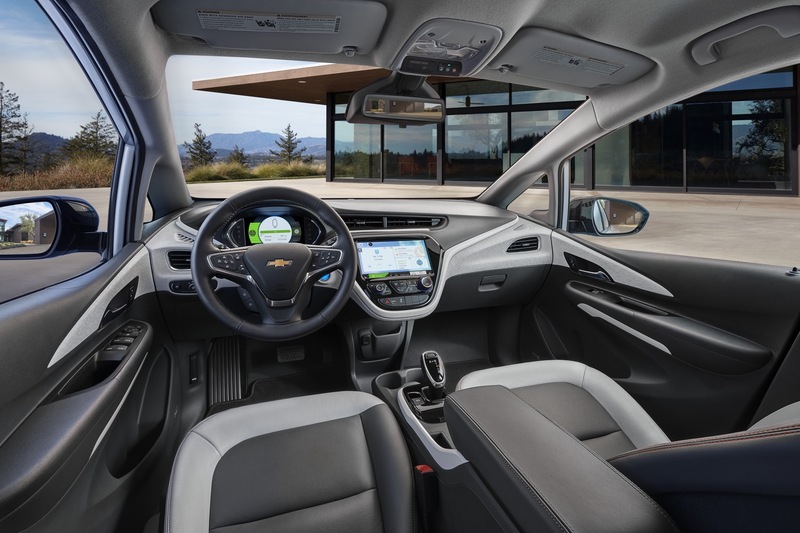 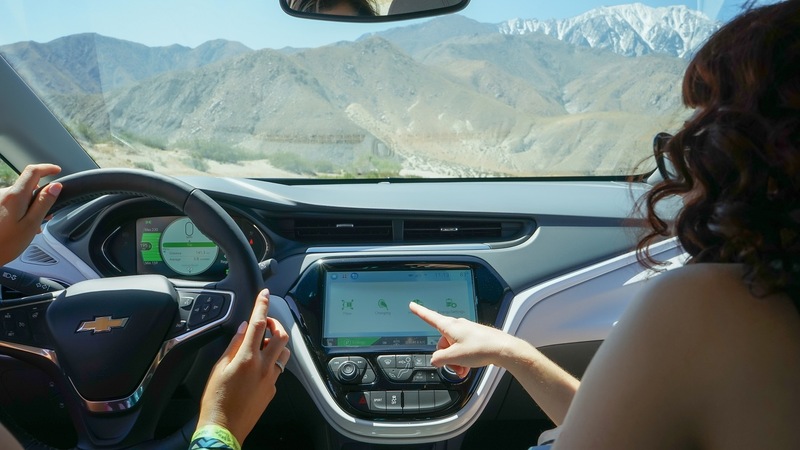 A large 10.2-inch touchscreen is the largest in any Chevy and serves as the interface for the MyLink infotainment system. 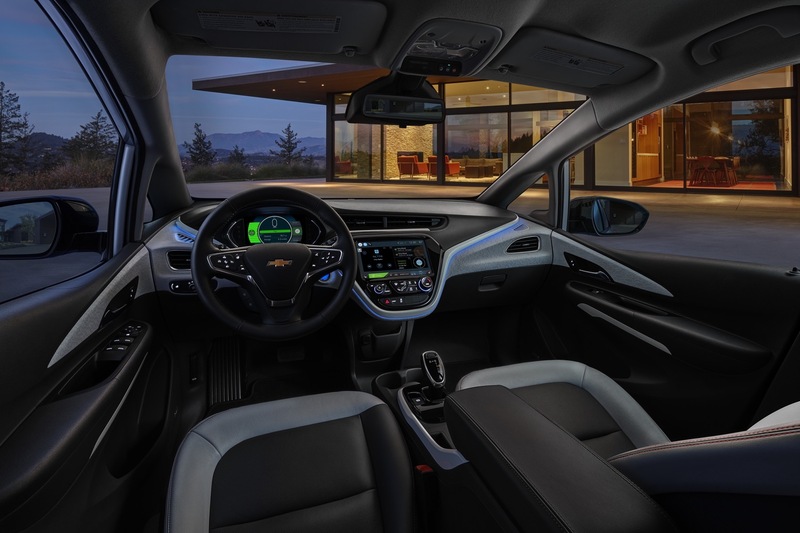 The instrument cluster, aka Driver Information Center, is all-digital and features an 8-inch diagonal enhanced multi-color configurable graphic display with three themes and energy-use monitors. 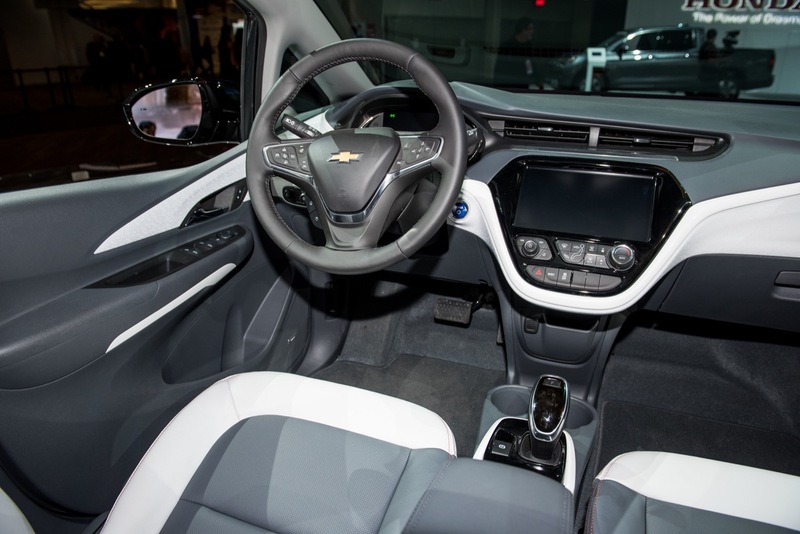 Overhead, the driver and front passengers have visors with sliding vanity mirrors. In the center, the overhead console features OnStar controls as well as LED front reading lights. 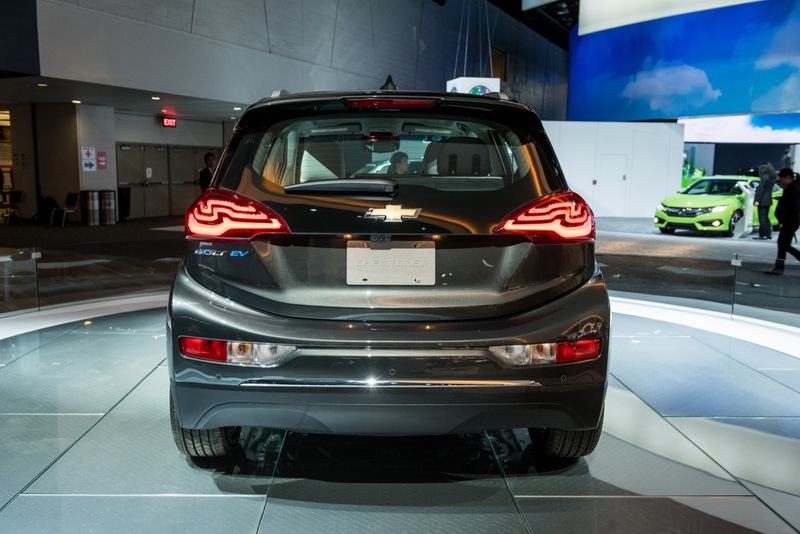 The dome lights are also LED, while the cargo area lamp is incandescent. 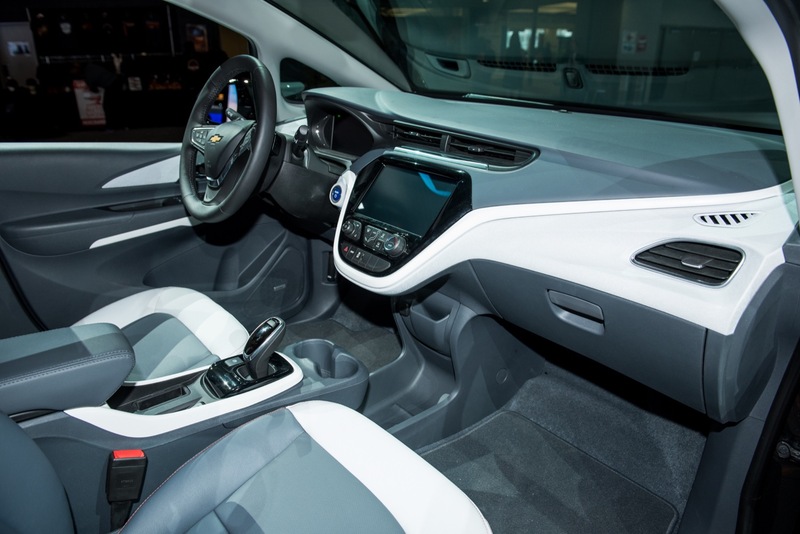 A standard glovebox is located on the passenger side of the vehicle. The space beneath the large infotainment is open, providing a useful storage space for occupants. Above it are two cupholders, followed by a shifter. 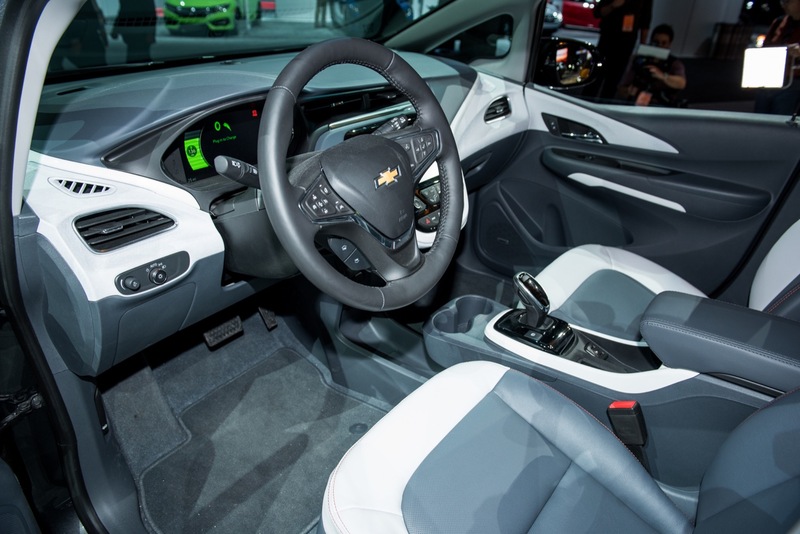 Shifting is performed using the new GM Electronic Precision Shift (EPS) shifter. The parking brake is electric push-button in the center console. 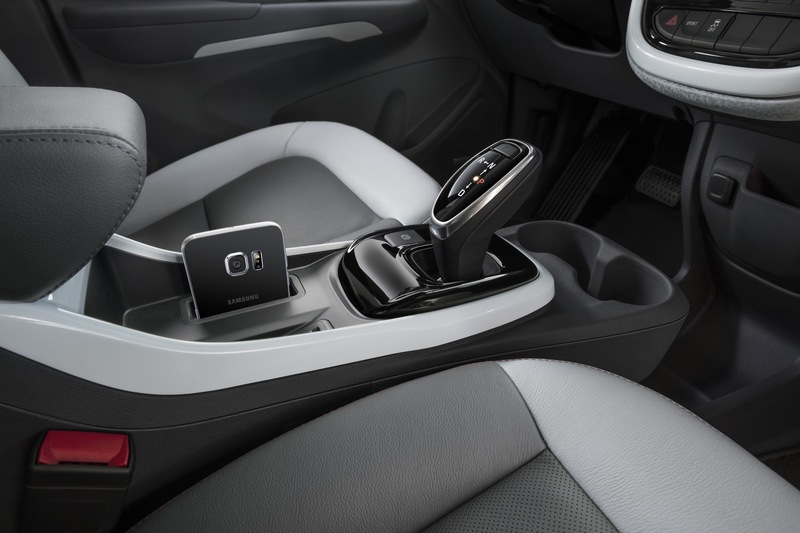 Two cutouts behind the shifter are designed for storing smartphones. 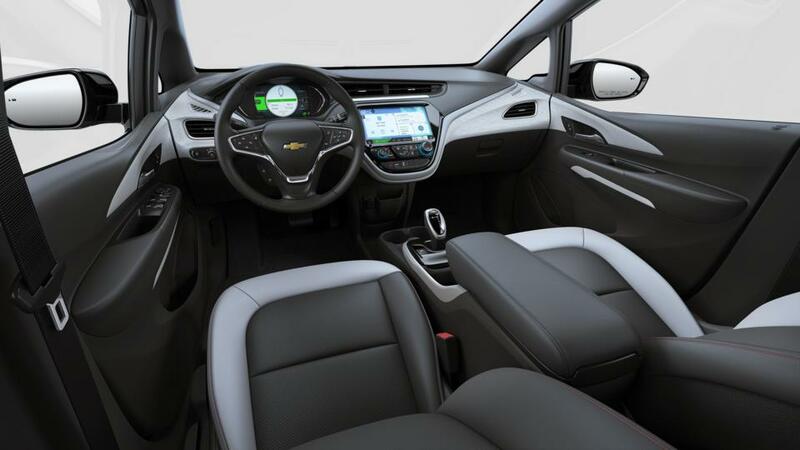 A sliding armrest enables optimal driver and front passenger comfort. 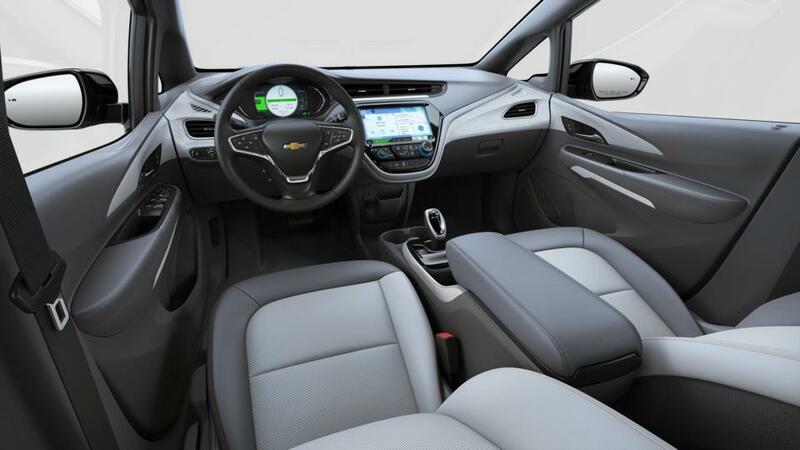 Two interior seat trim materials are available: deluxe cloth is standard on LT models while perforated leather is standard on the Premier trim. 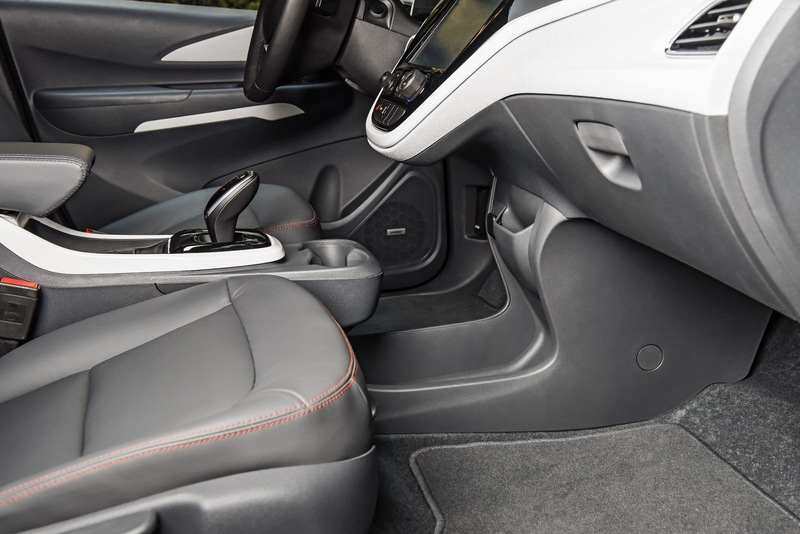 Carpet floor mats for the front and rear are standard. 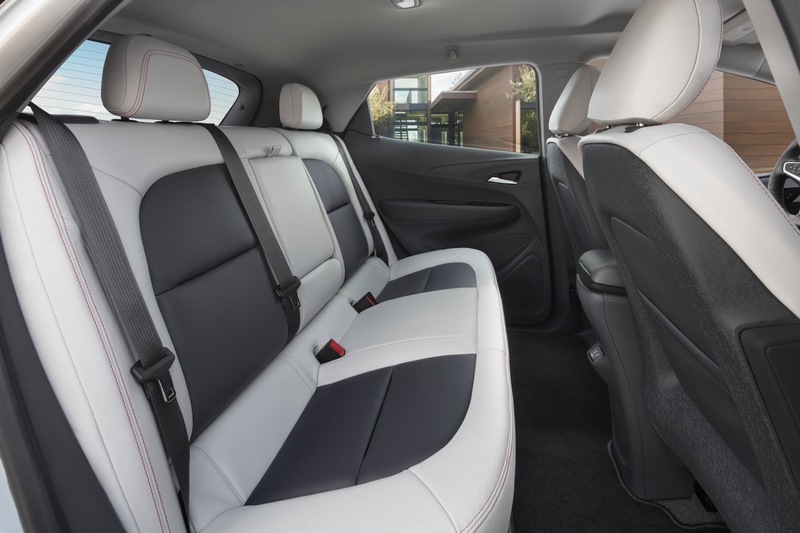 The rear seats feature pockets on the front seatbacks as well as an armrest with two cupholders. 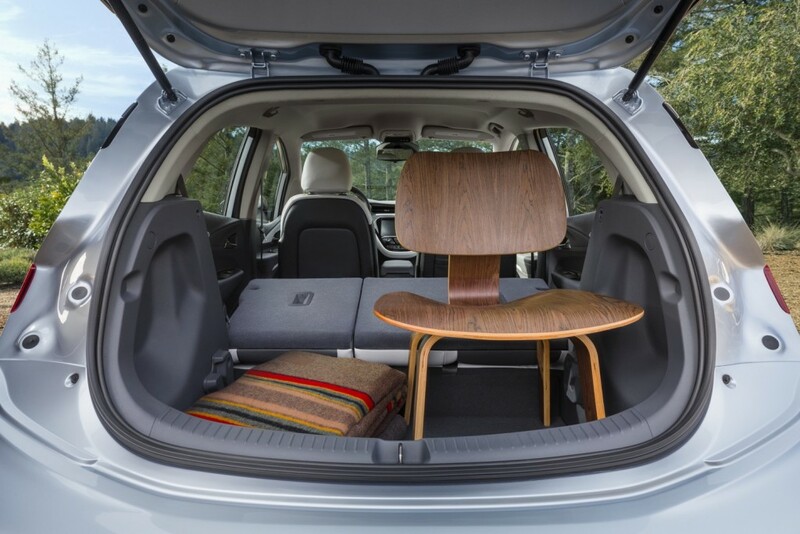 The rear seat is 60/40 split folding, but does not fold flat. On Premier models, the outboard rear seats are heated. 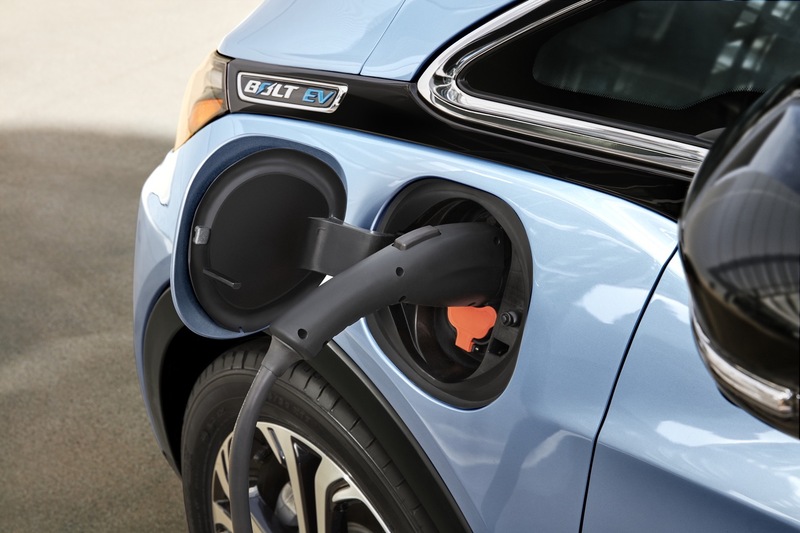 The cargo area includes storage for the Bolt EV’s charging cord. 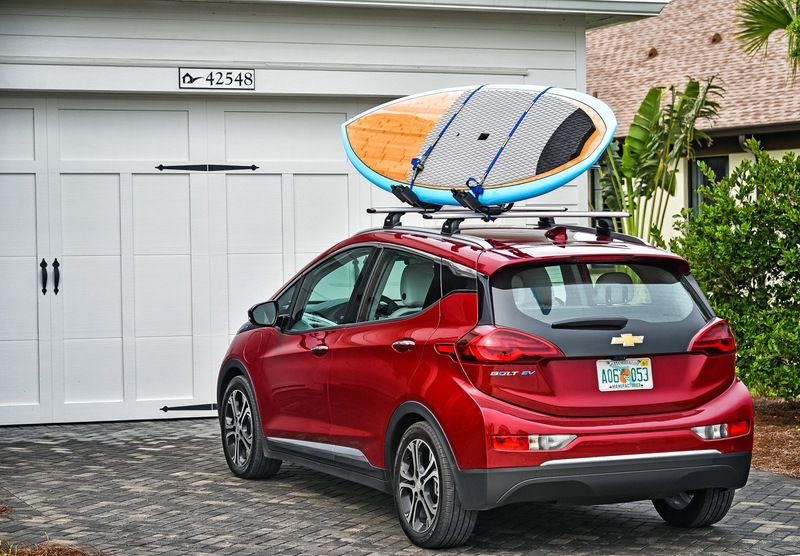 Double floor rear storage is standard on Premier and available on LT. A cargo cover is standard. 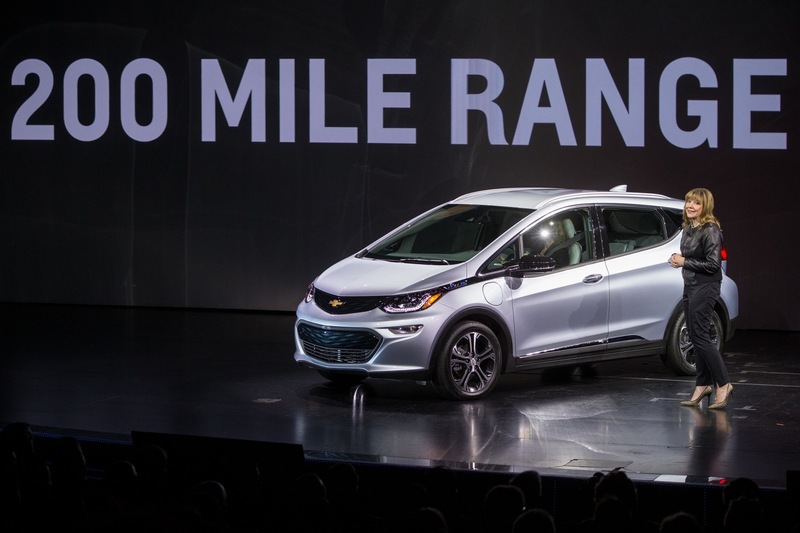 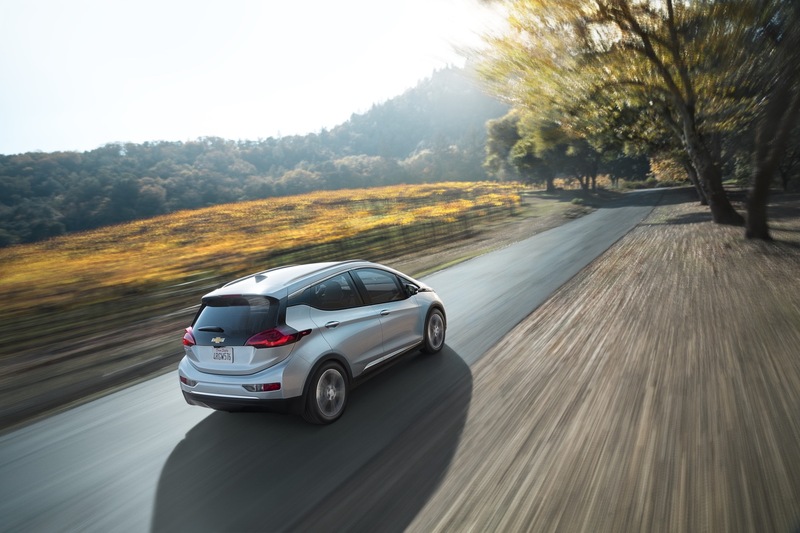 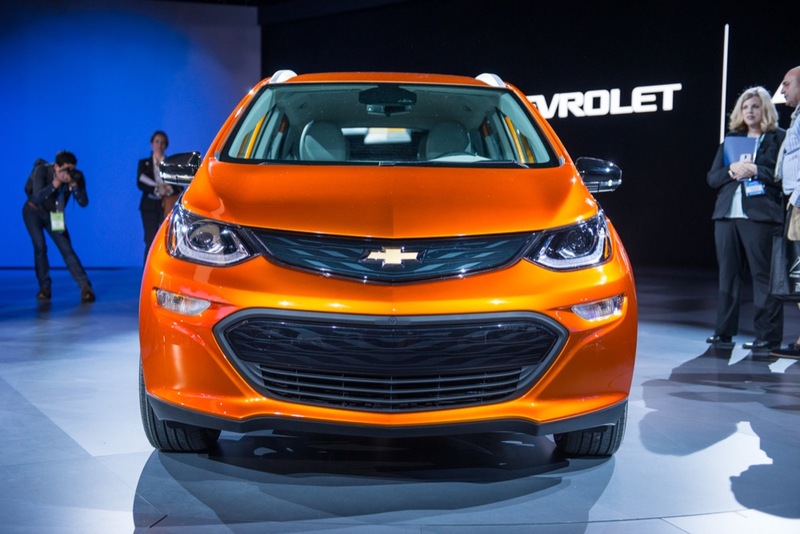 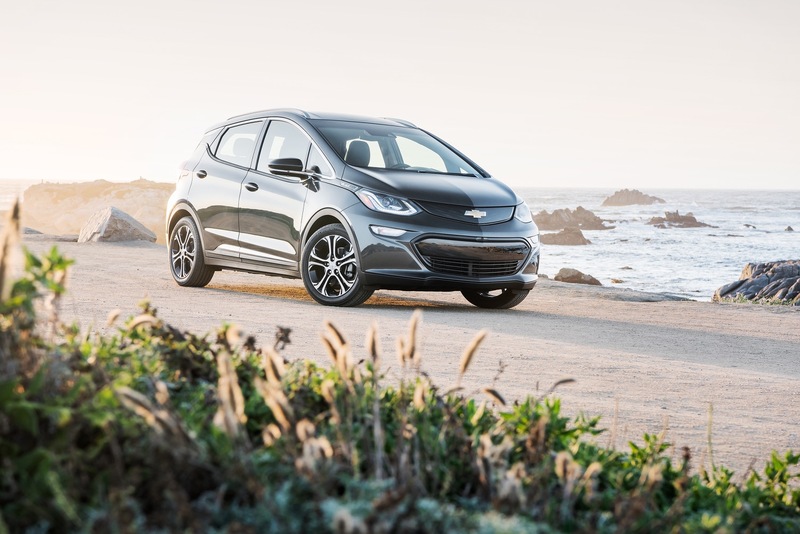 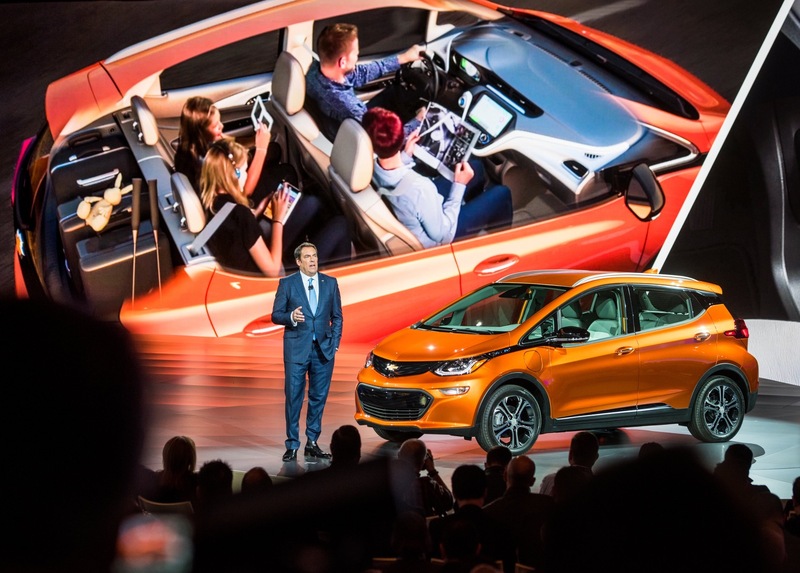 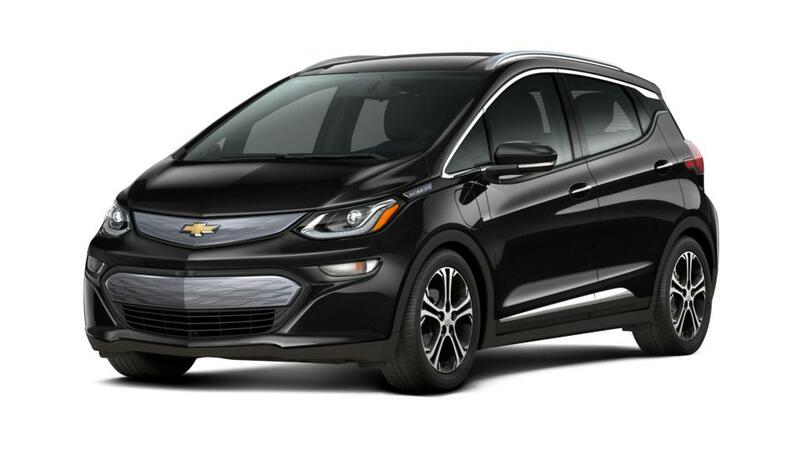 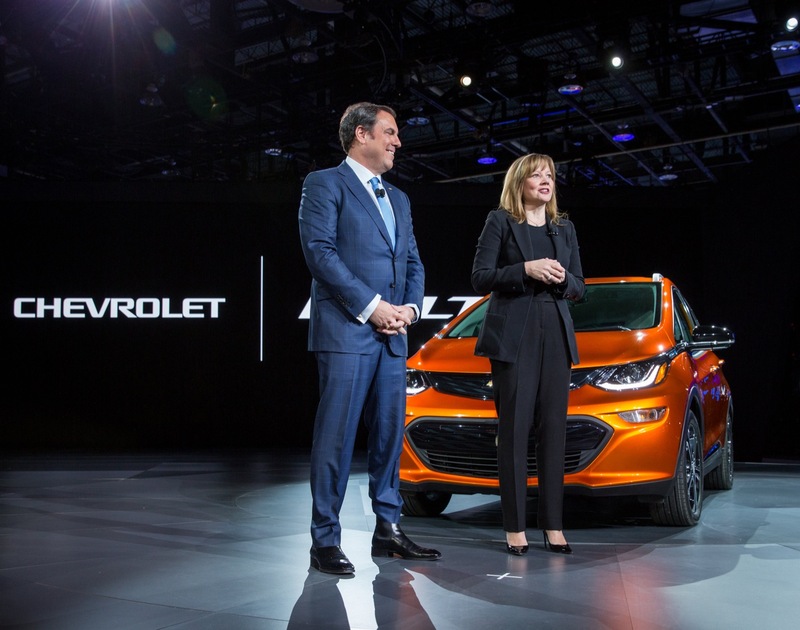 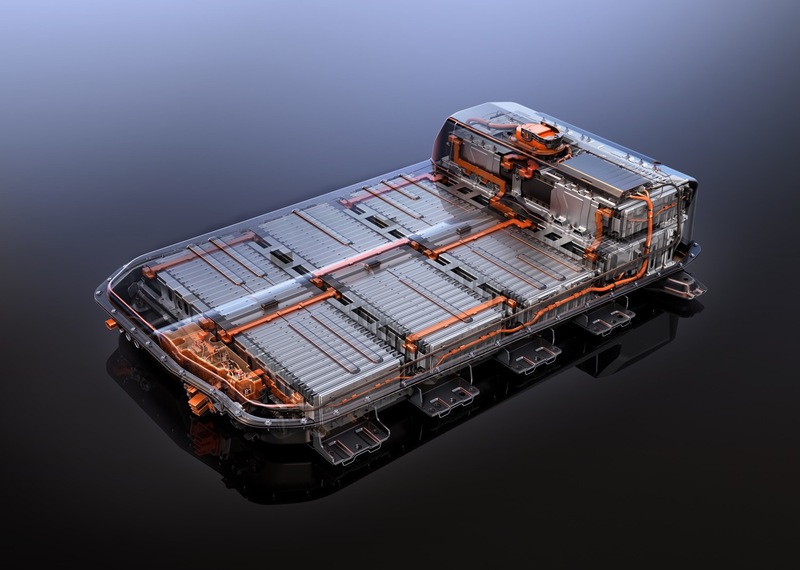 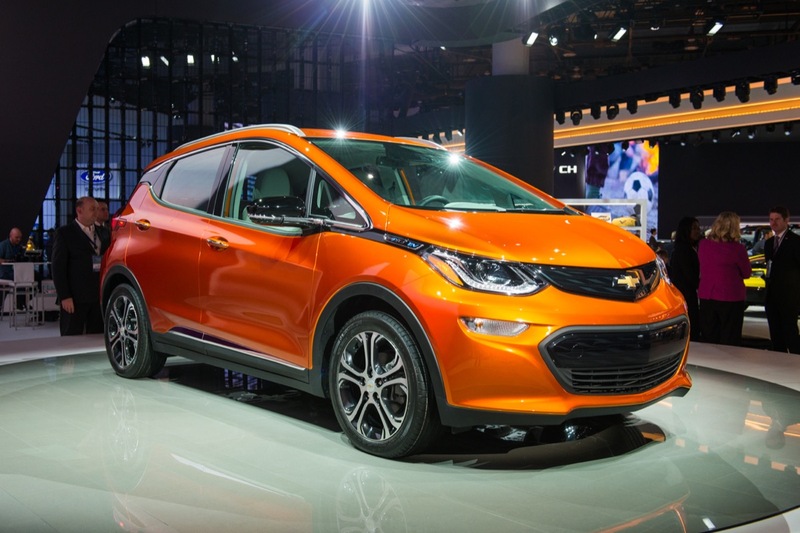 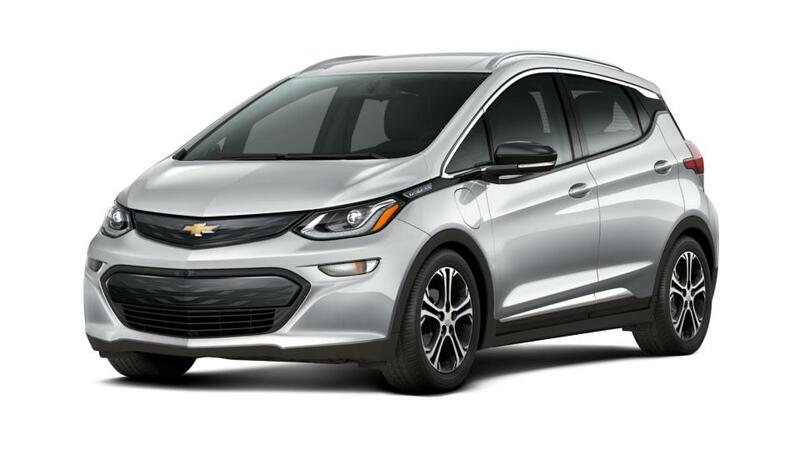 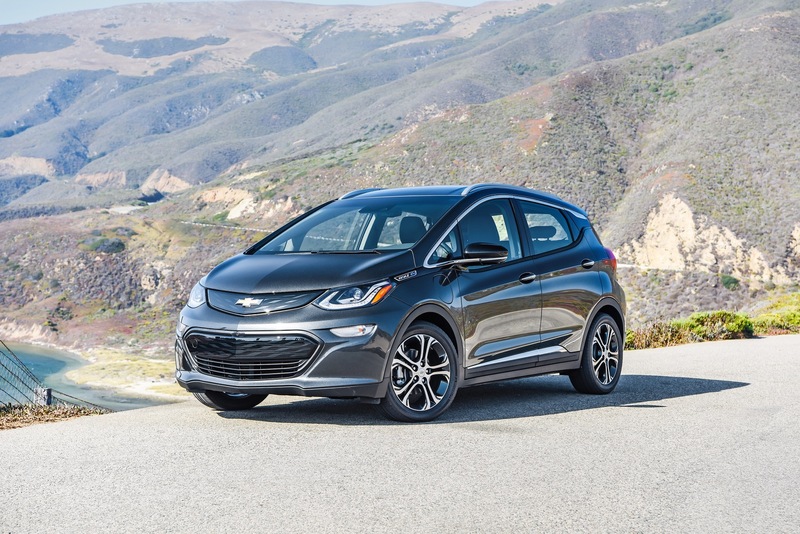 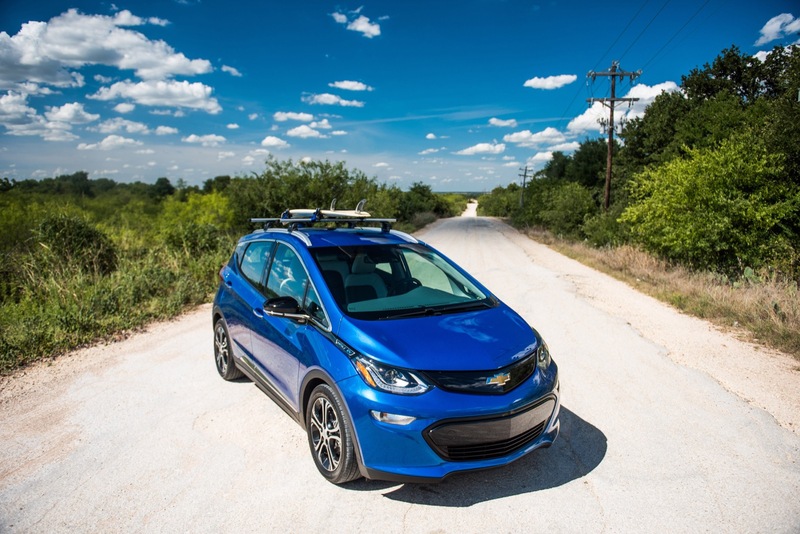 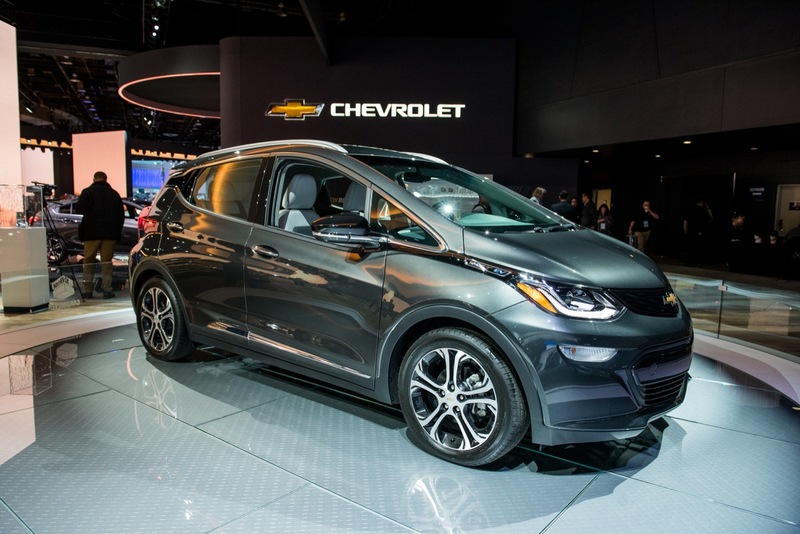 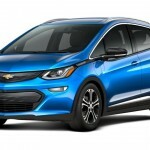 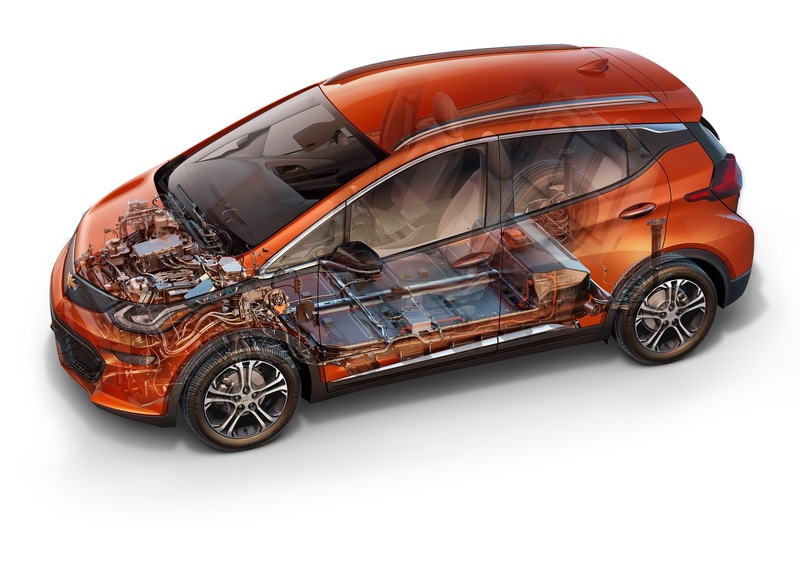 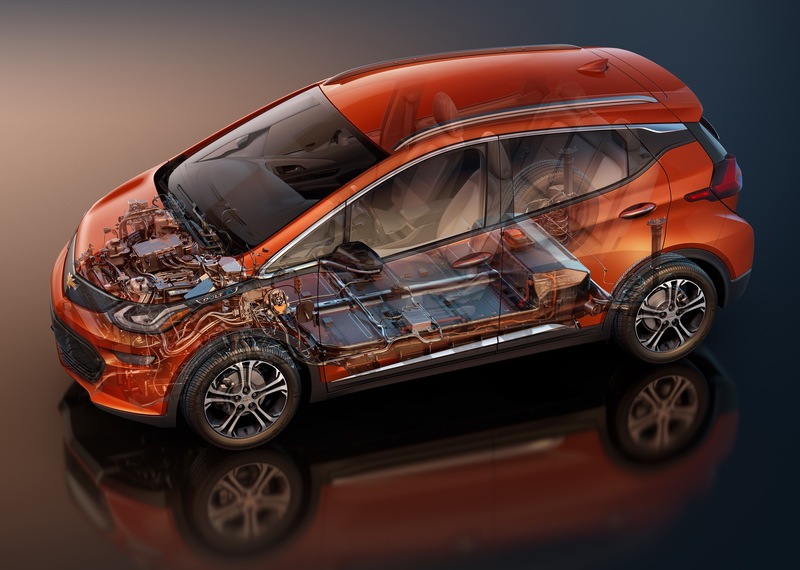 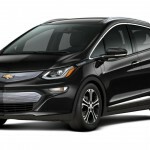 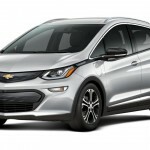 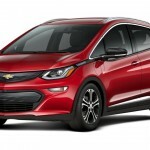 When the Chevrolet Bolt Concept was initially announced, industry observers pointed out to the obvious similarity between the Chevrolet Bolt and Chevrolet Volt names (the Volt is an extended-range electric vehicle from Chevrolet that has been in production since 2010). 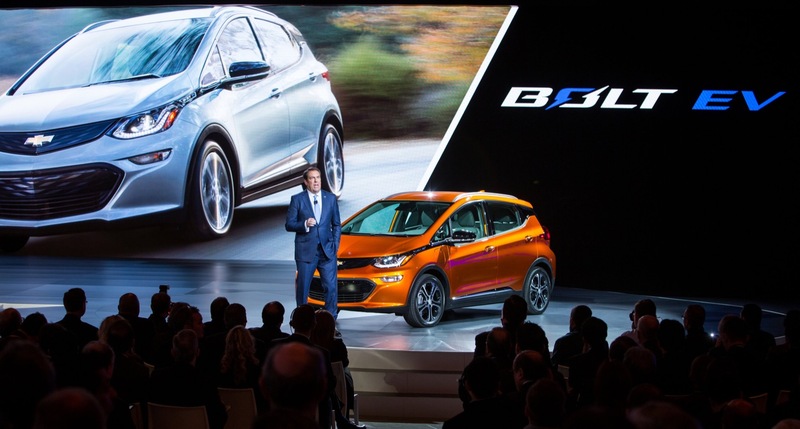 Onlookers pointed out the possible confusion between the two names. 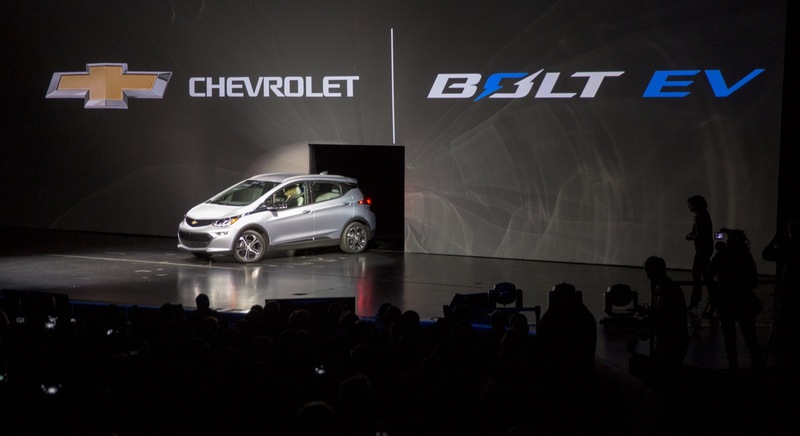 However, General Motors has stood its ground on the Bolt nameplate, officially confirming that the production vehicle will carry the Bolt moniker. GM’s trademark filings with the USPTO for the Bolt EV and Chevrolet Bolt EV names confirm this to be the case. 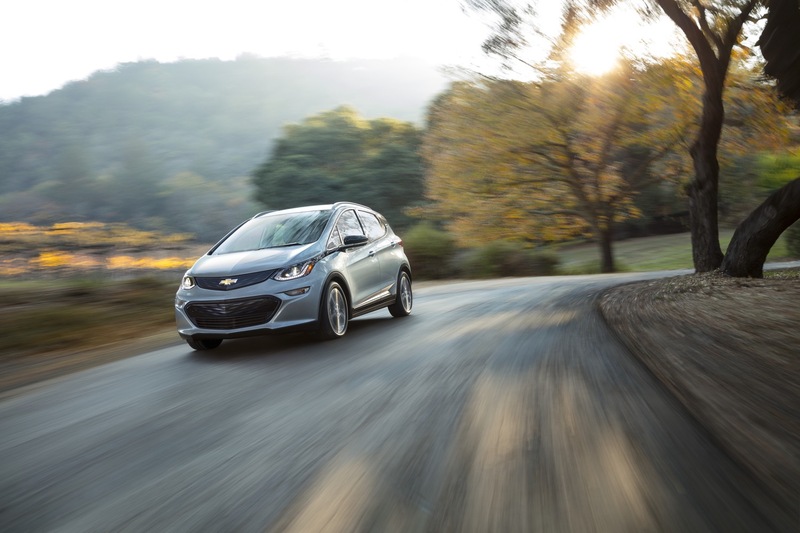 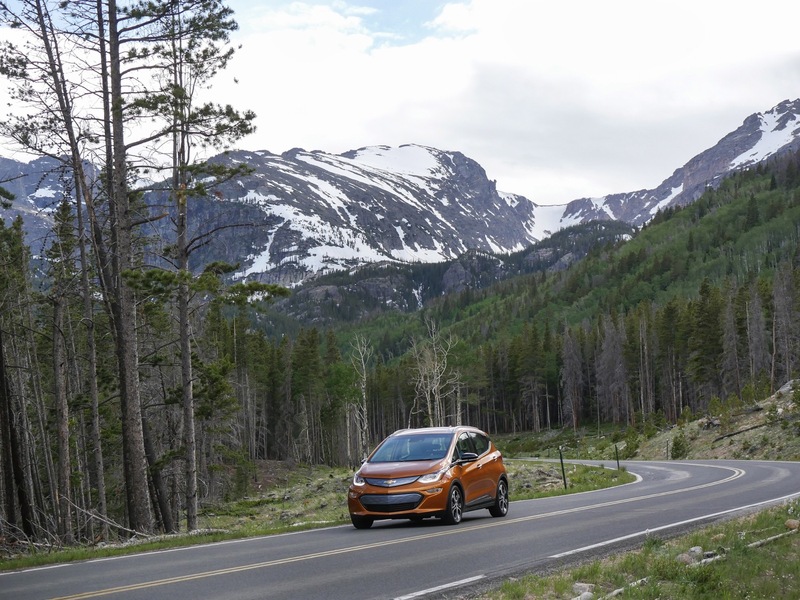 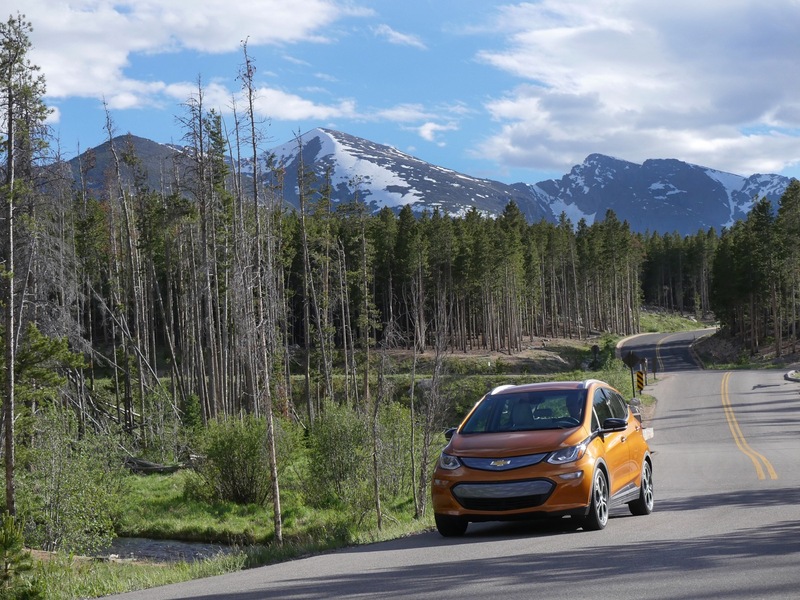 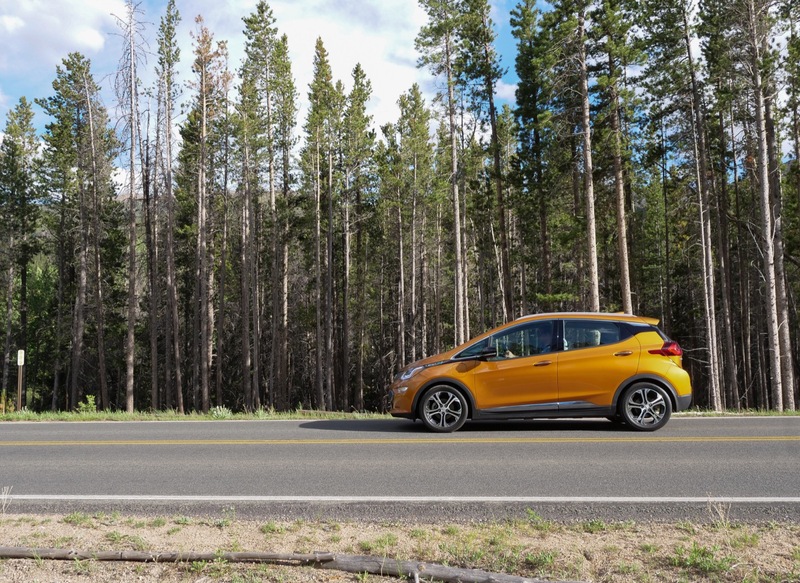 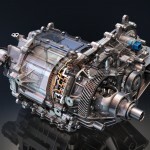 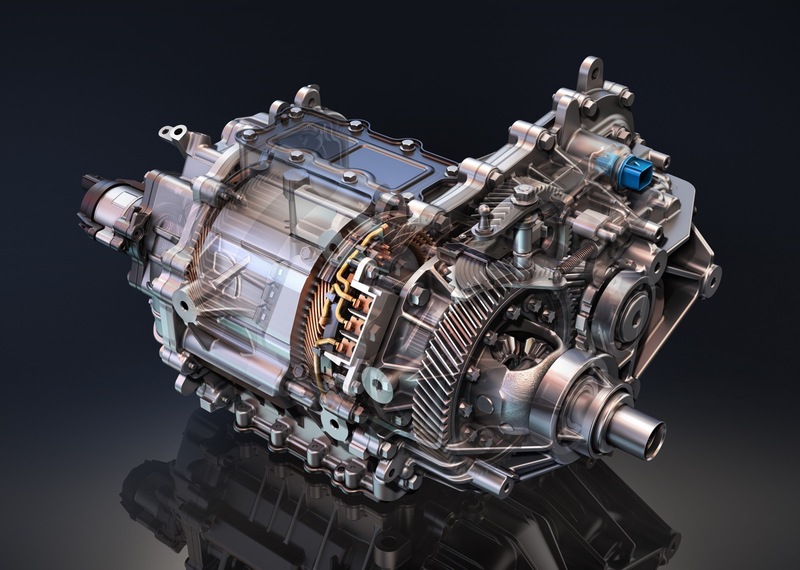 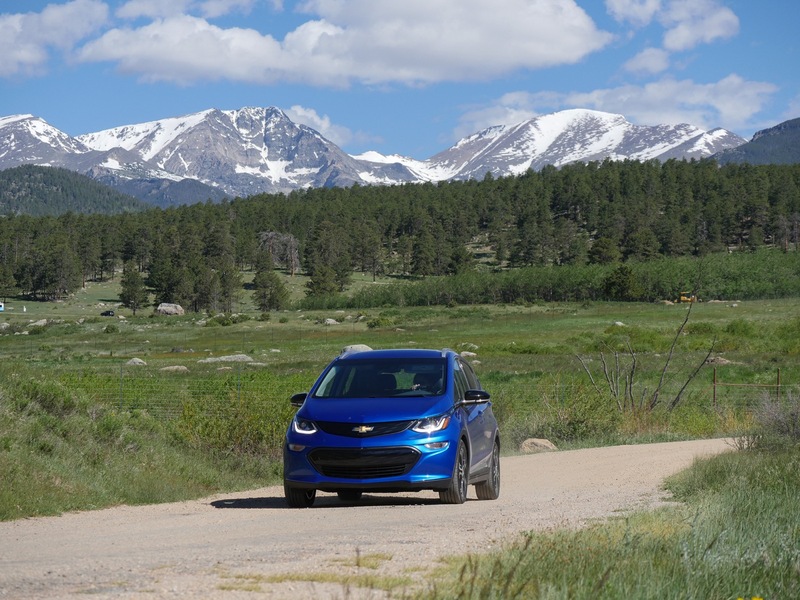 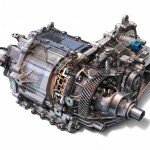 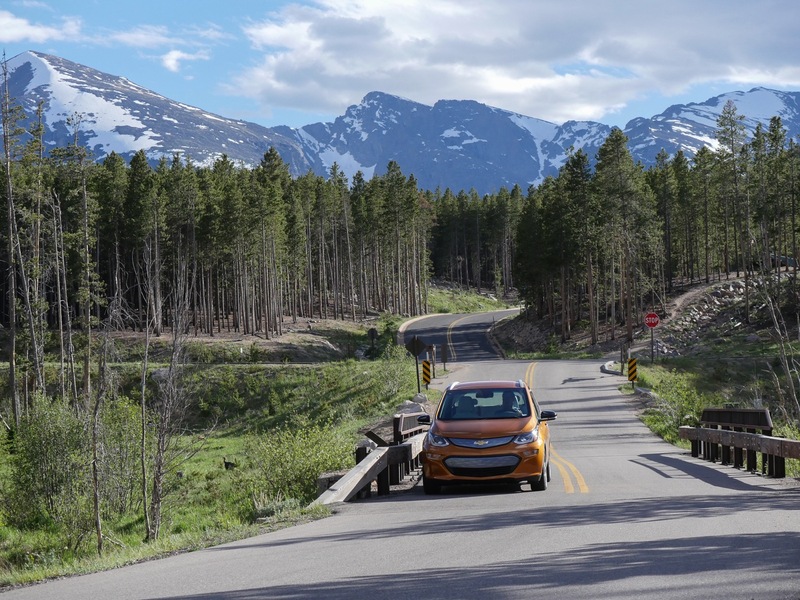 Engineers developed the Bolt EV’s propulsion system to offer more than an estimated 200 miles (based on GM estimates) and a delightful driving experience that’s more akin to a compact sports sedan than a small utilitarian crossover. 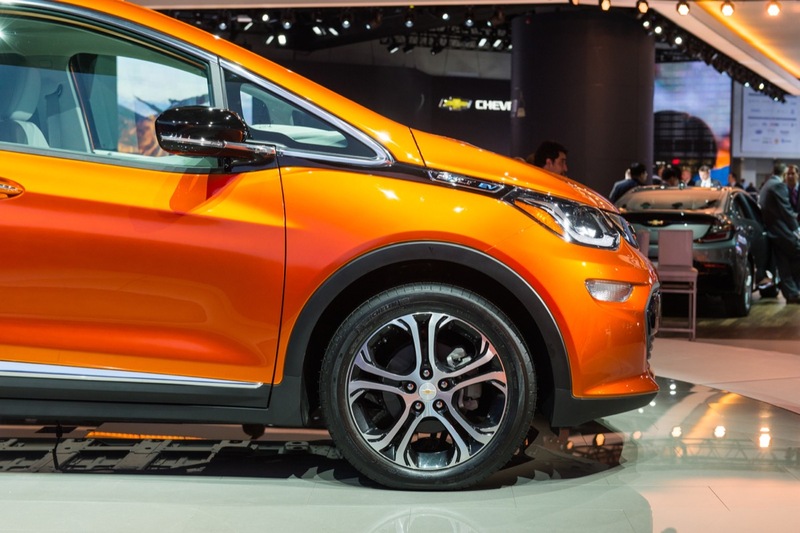 The 2017 Chevrolet Bolt EV is believed to be based on GM’s upcoming G2XX platform shared with the next-gen Sonic/Aveo. 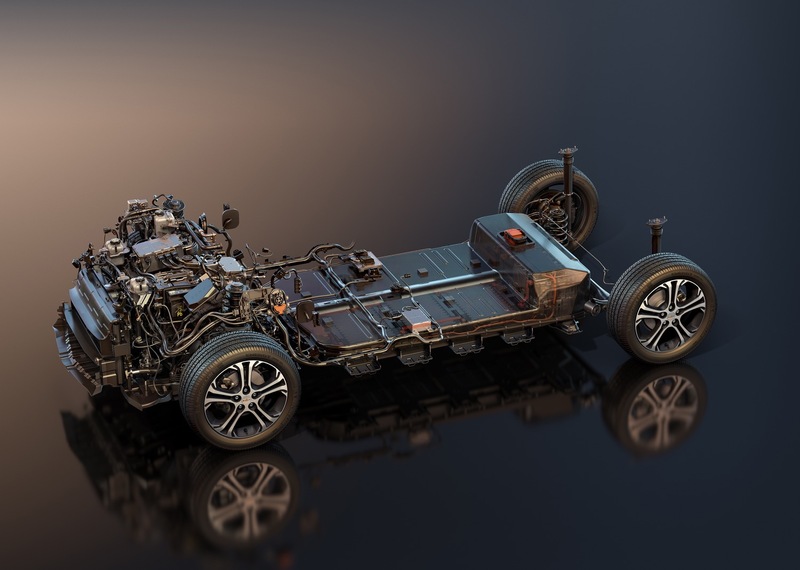 The architecture brings about lightweight construction with advanced materials, delivering a lower curb weight that traditional materials. 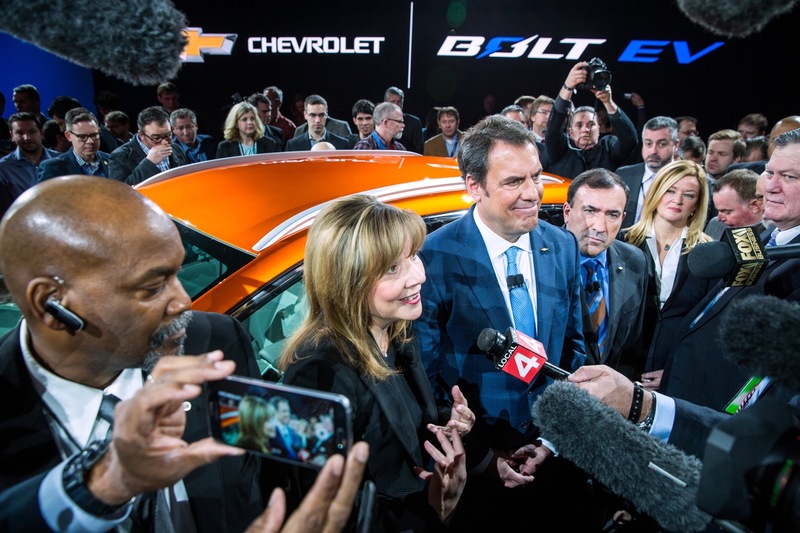 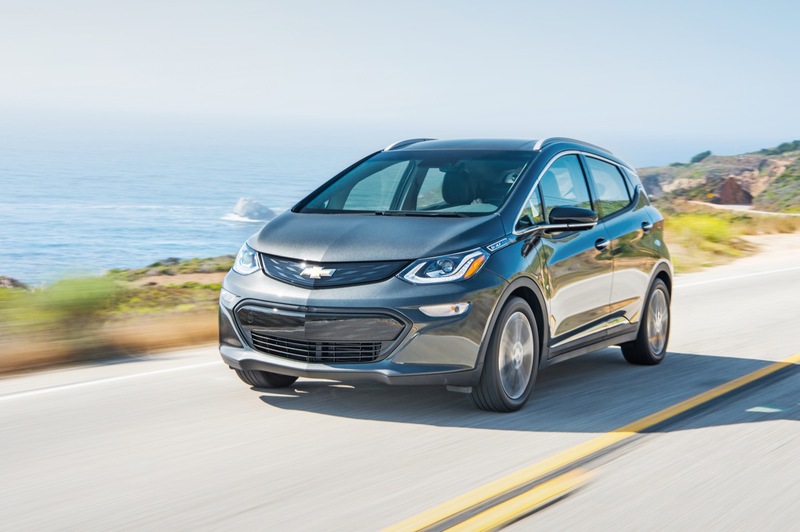 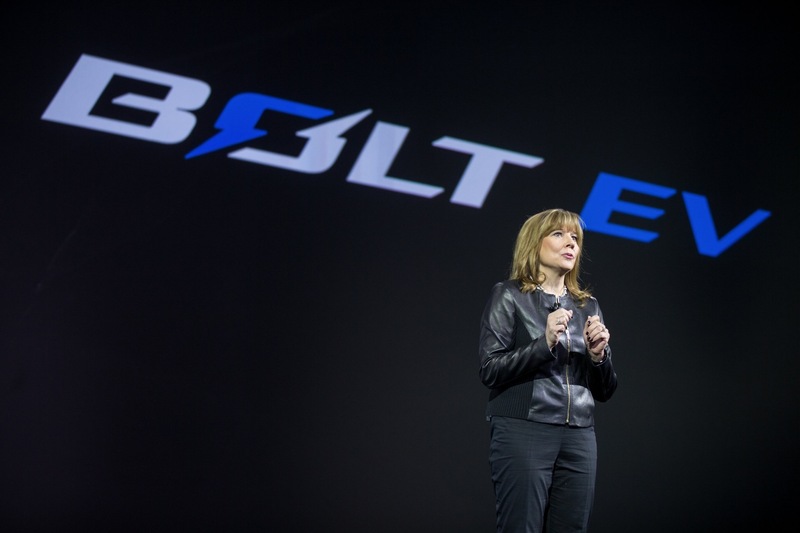 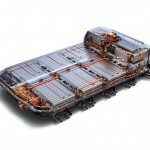 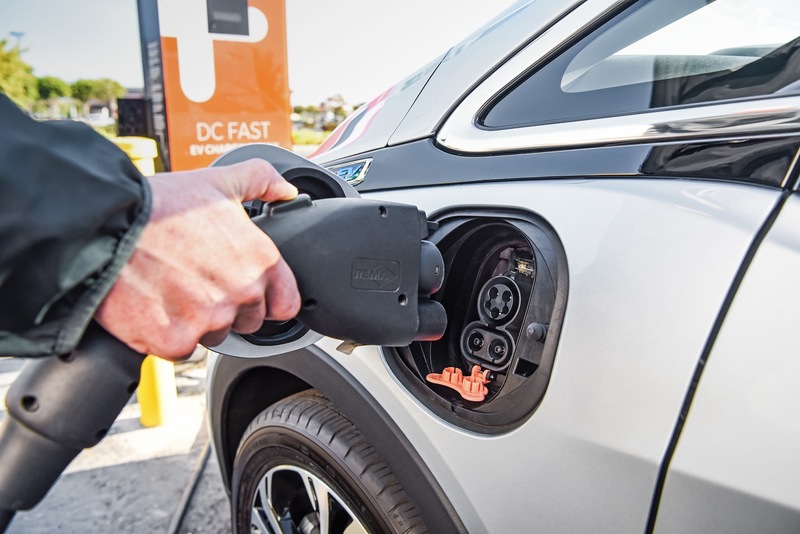 On February 12th, 2015, General Motors confirmed that the Bolt EV will be produced at its Orion Assembly Plant in Orion Township, Michigan, USA. 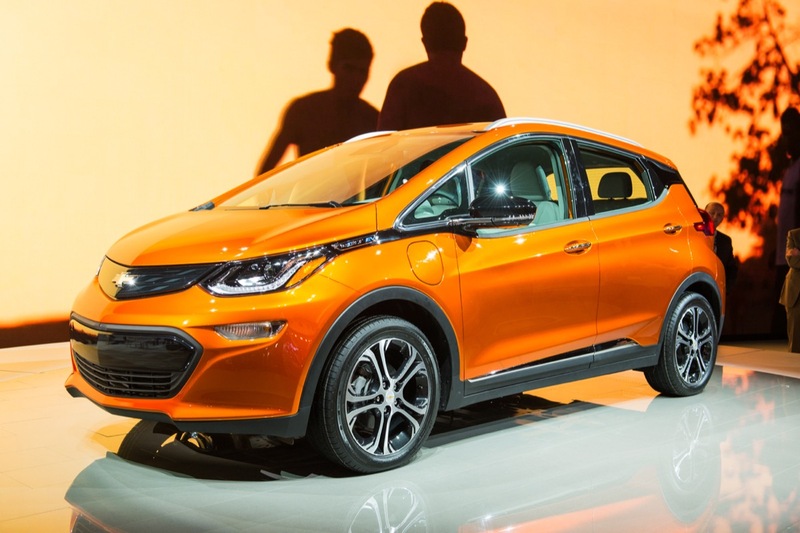 It will go into production by the end of 2016. 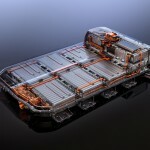 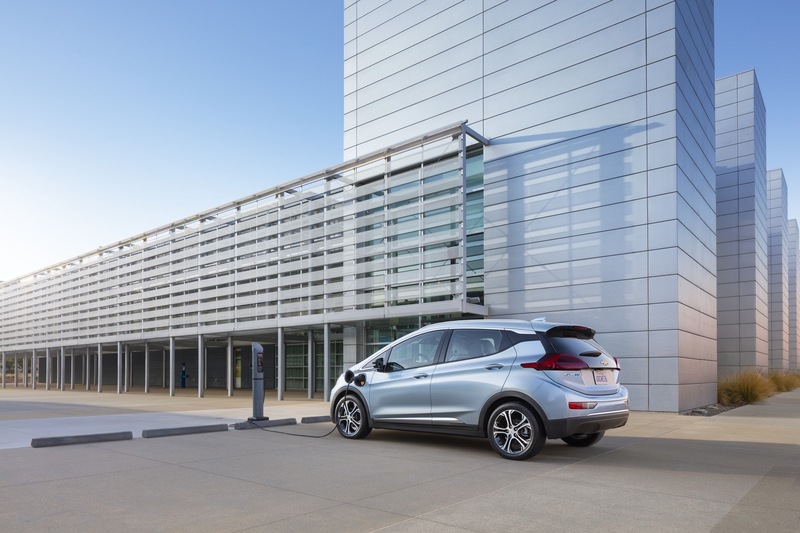 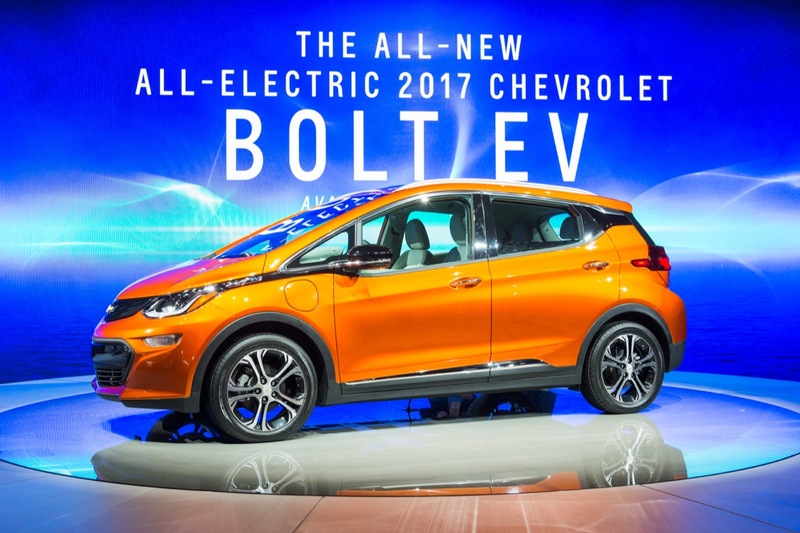 The 2017 Chevy Bolt EV went into production at the end of 2016 as a 2017 model year vehicle. 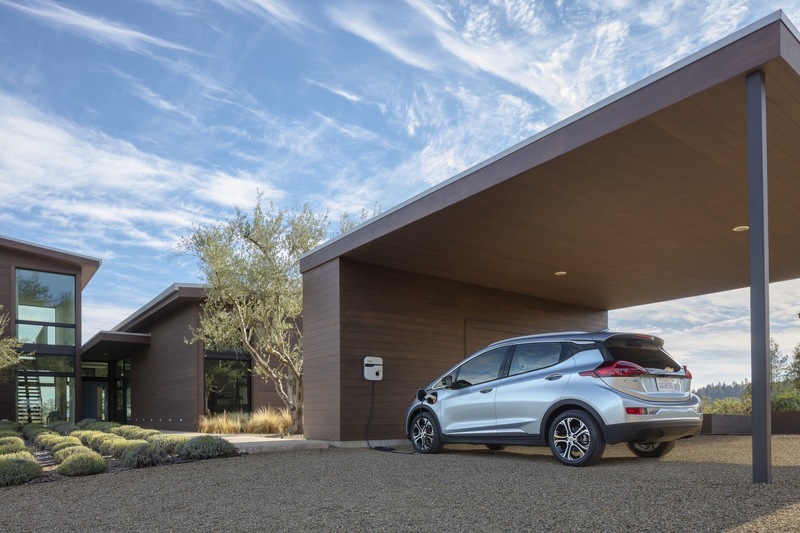 U.S. deliveries began in December 2016 in select states and Canadian deliveries began in January 2017. 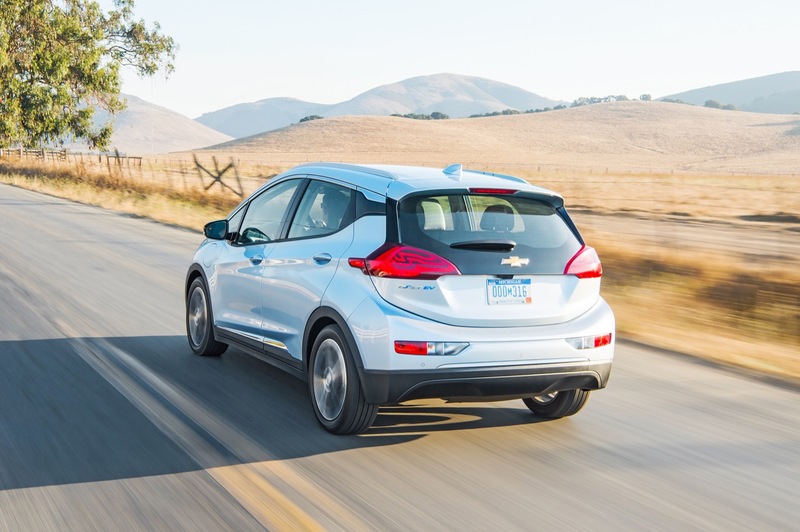 The Chevy Bolt was initially rolled at two select markets in the United States – California and Oregon. 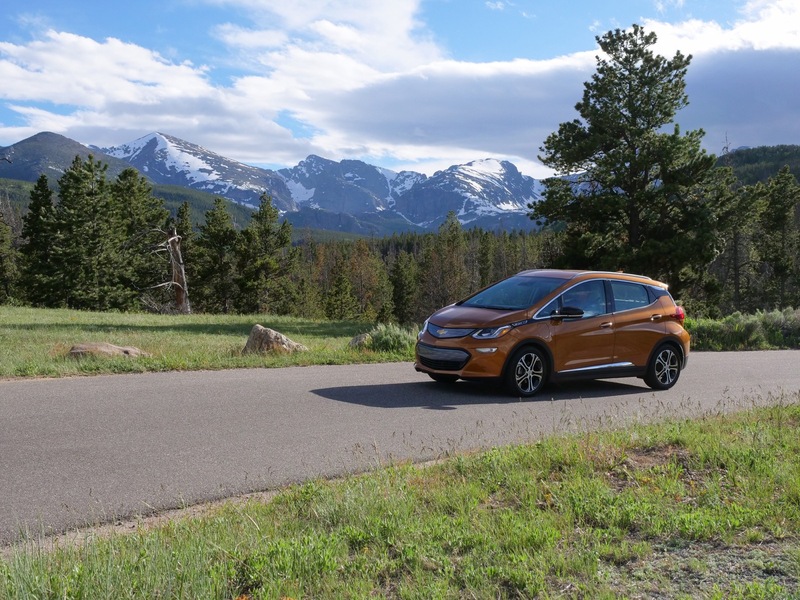 In August 2017, the vehicle became available nationwide, which is a full month ahead of schedule. 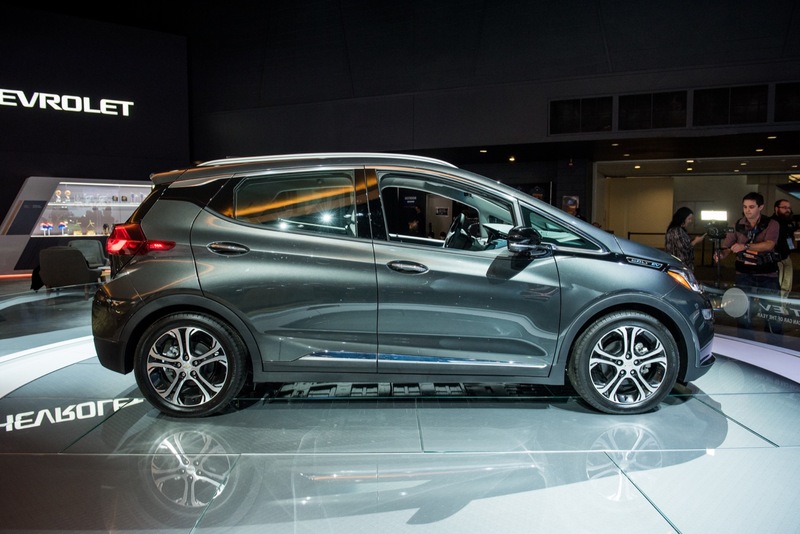 A variant of the Chevrolet Bolt EV for GM’s European Opel brand possible variant for the European-market Opel brand. 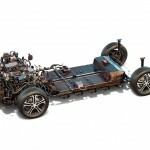 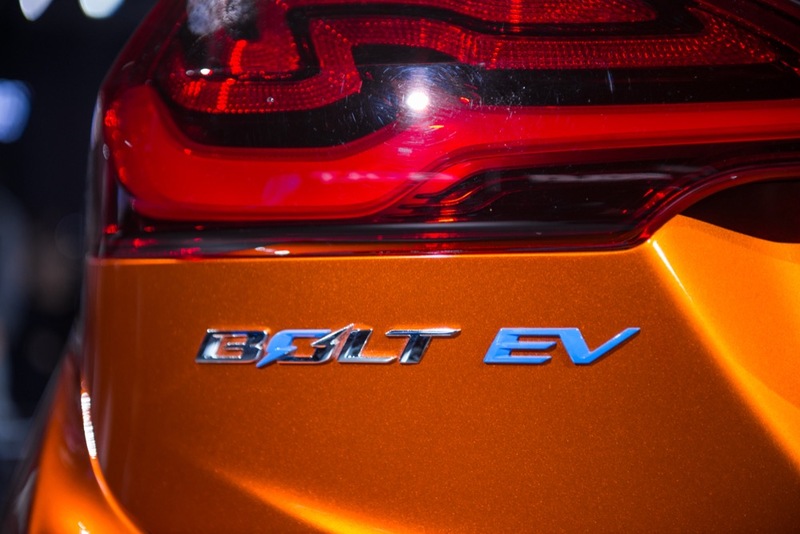 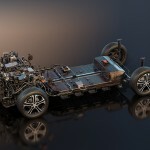 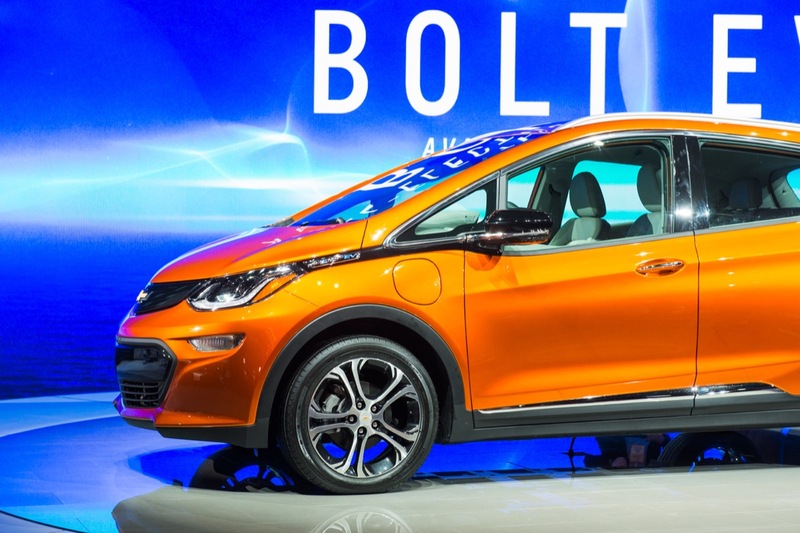 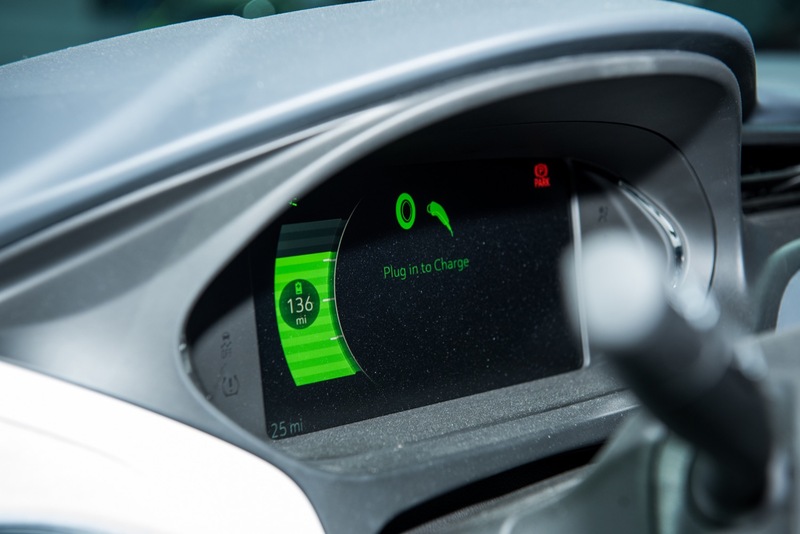 However, the Bolt EV will not be available in right-hand drive configurations, meaning that markets such as the United Kingdom (served by GM’s Vauxhall brand) nor Australia or New Zealand (served by GM’s Holden brand) will receive a variant of the vehicle. 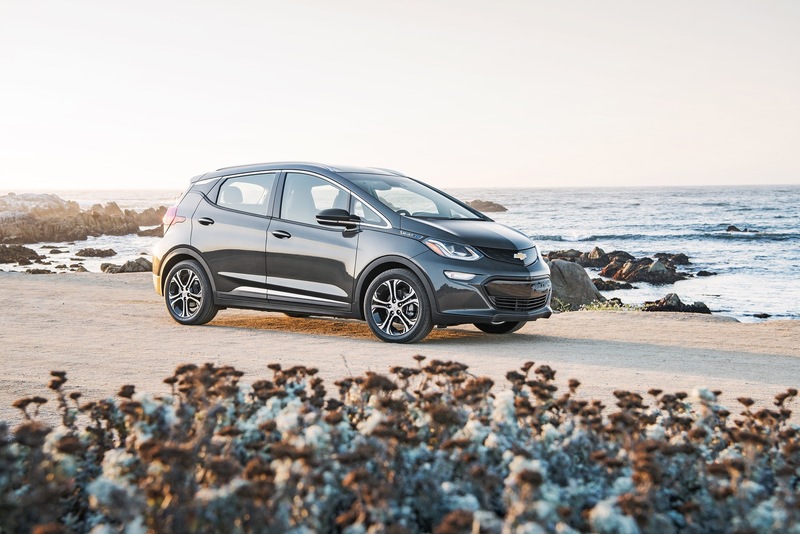 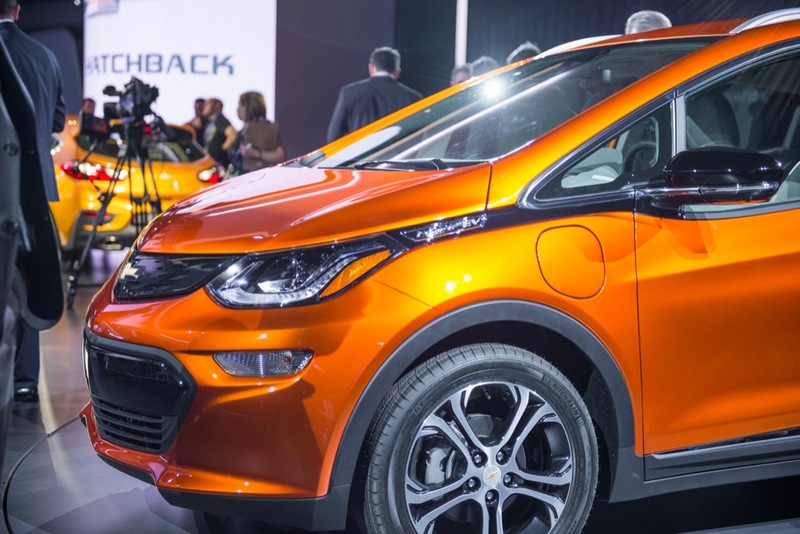 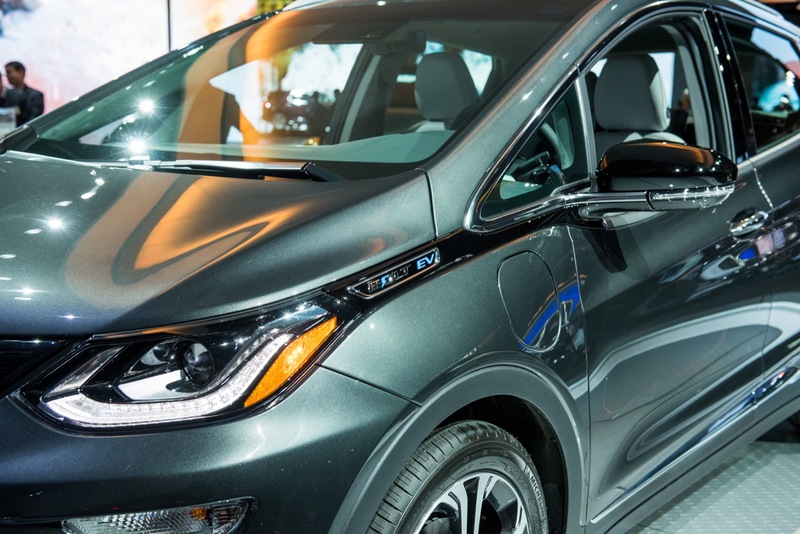 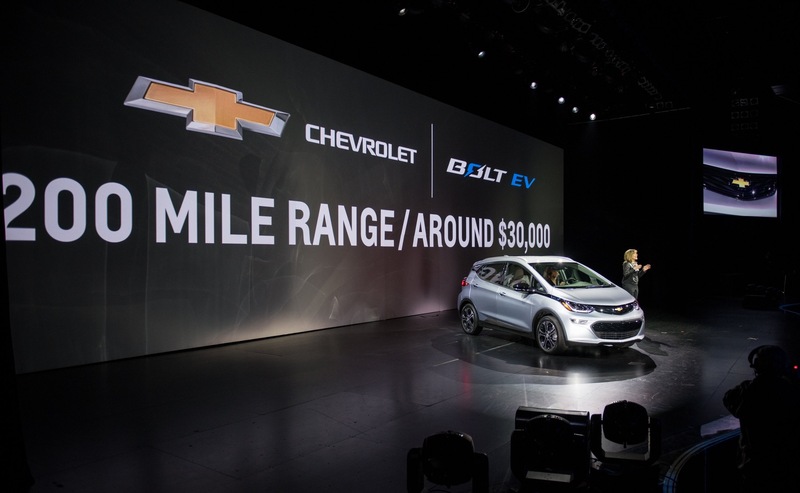 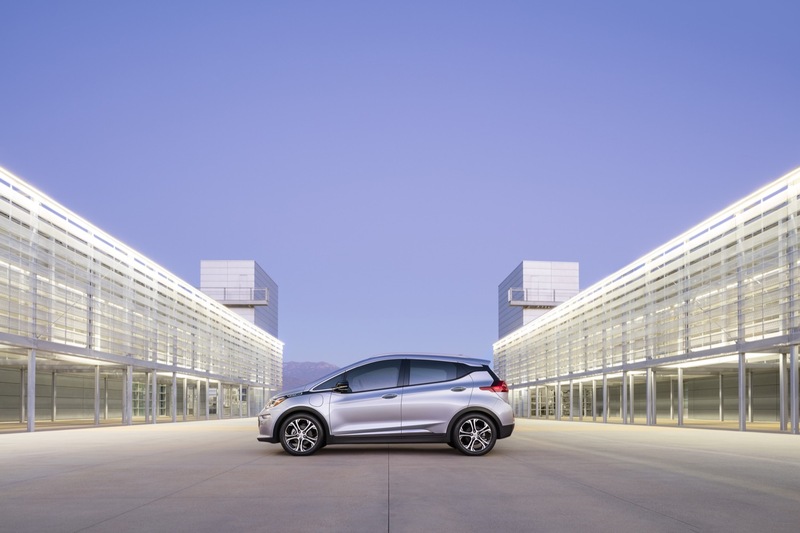 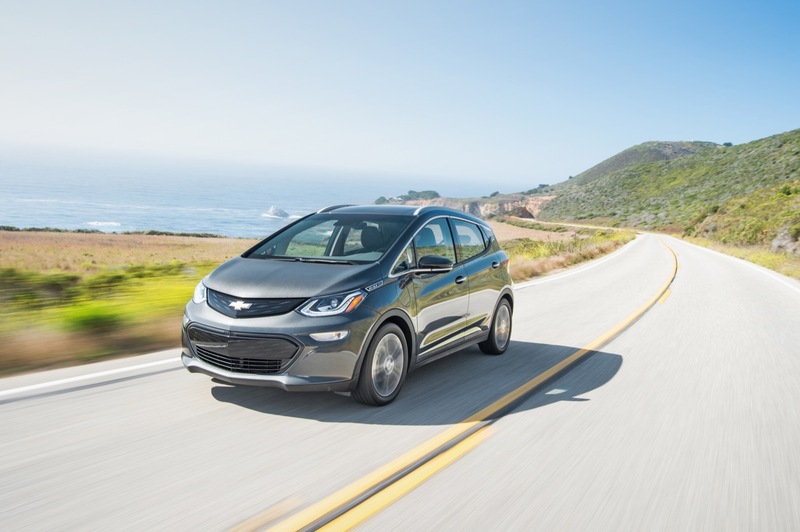 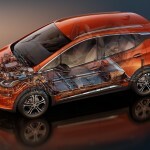 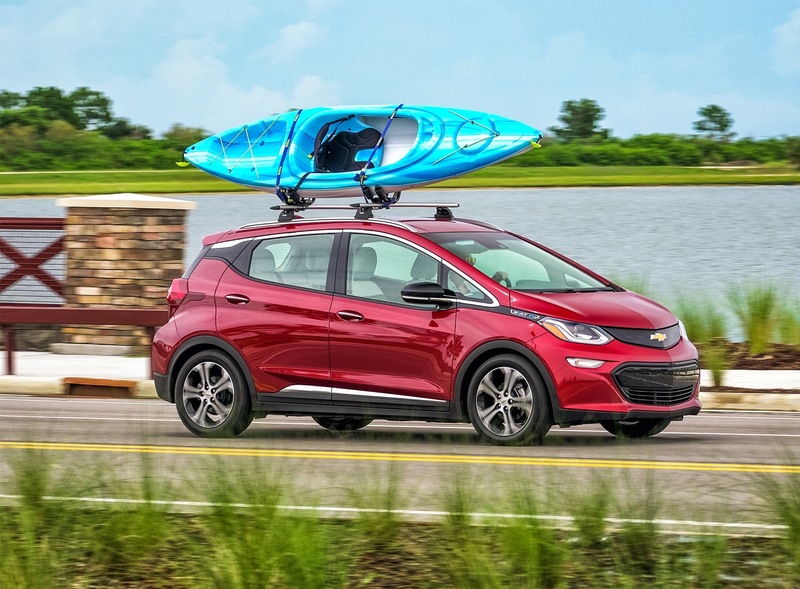 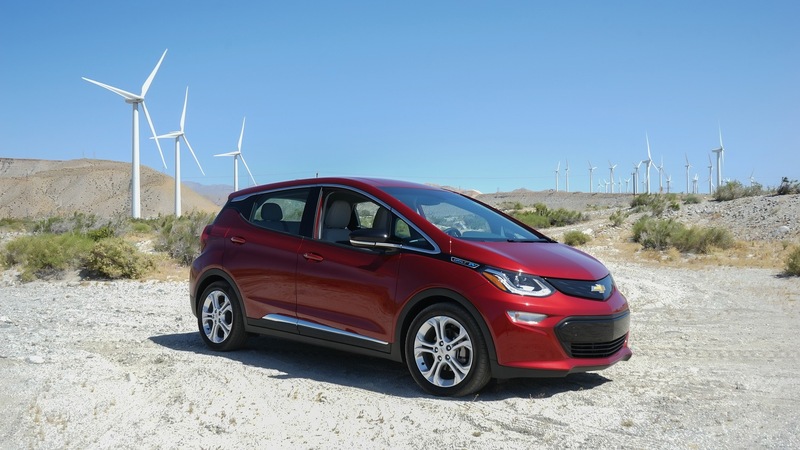 General Motors has not officially priced the 2017 Chevrolet Bolt EV, but it has announced that it will carry a price of roughly $30,000, after federal rebates and incentives. 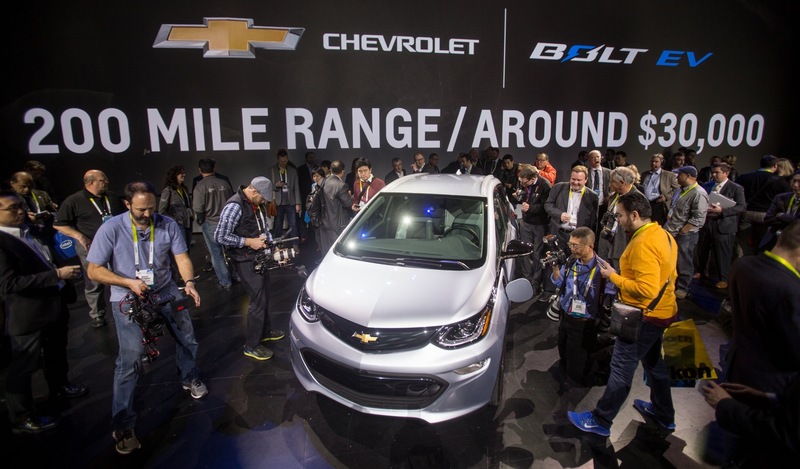 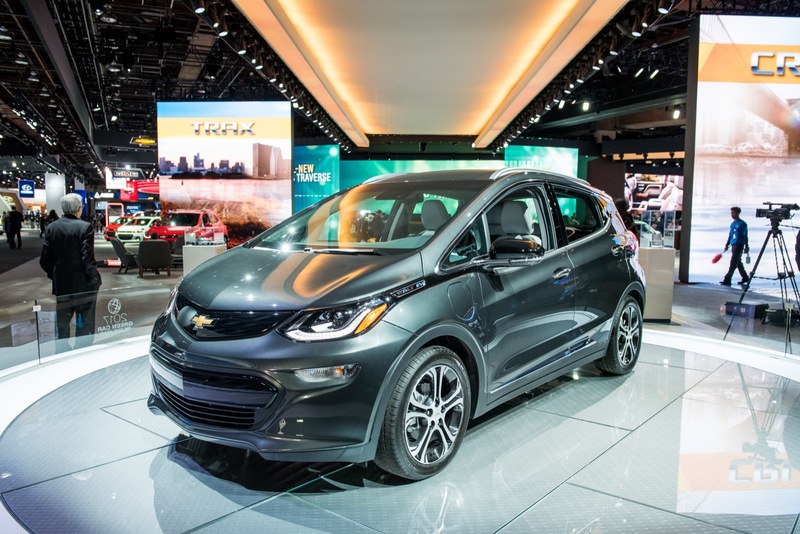 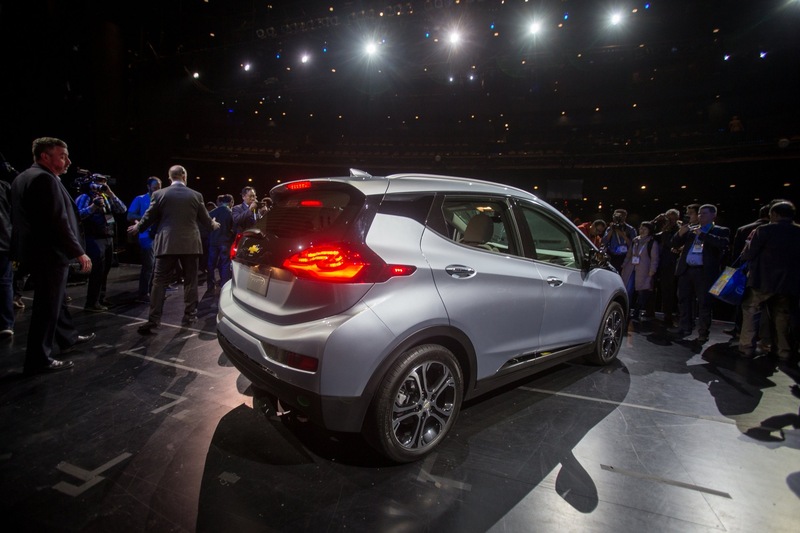 The 2017 Chevy Bolt EV was unveiled on January 6th, 2016 at the 2016 Consumer Electronics Show (CES) in Las Vegas, Nevada. 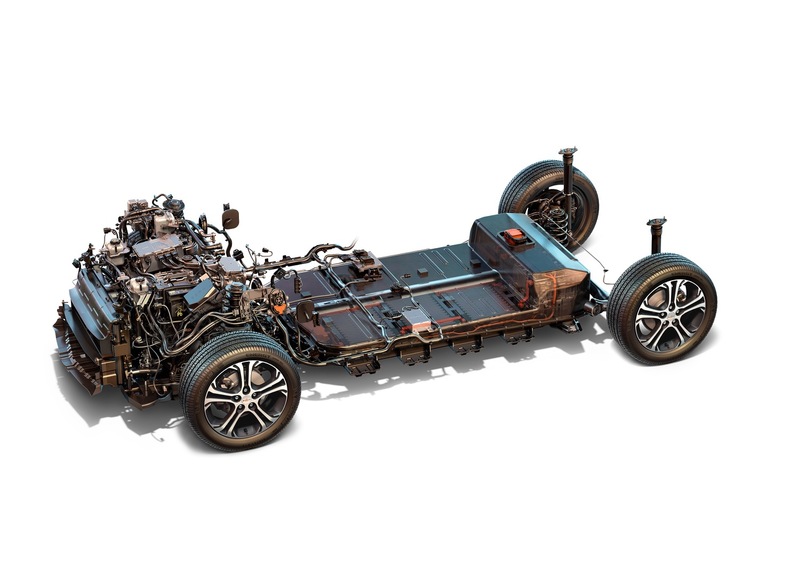 Manufacturing location: GM Lake Orion Assembly in Orion Township Michigan USA"
Front: Independent MacPherson strut-type front suspension with side load compensating and finely tuned springs, direct-acting solid stabilizer bar system and ride & handling oriented LCA bushings. 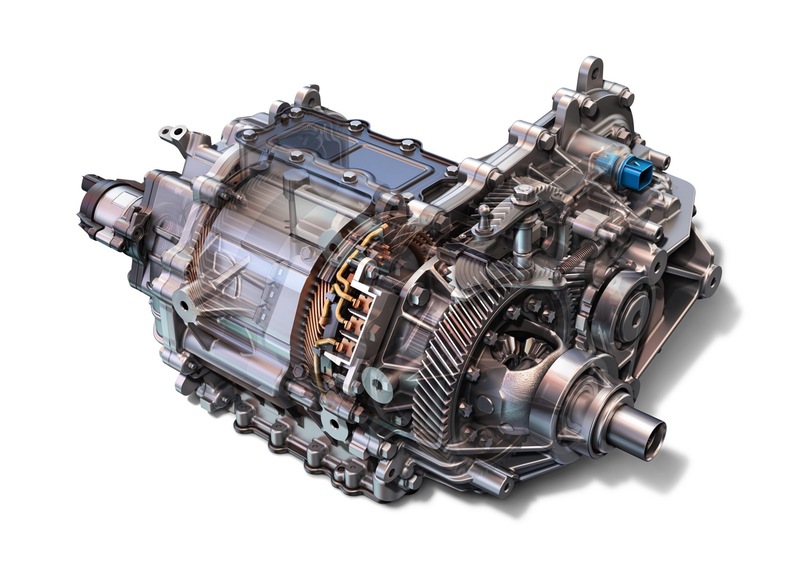 Rear: Compound crank (torsion beam) type rear suspension with the closed section V-shaped profile axle; specifically tuned coil springs, performance balanced shock absorber, angled A-bushing supporting understeer tendency on cornering maneuver and kinematically optimized torsion beam providing stable and best ride & handling performance. 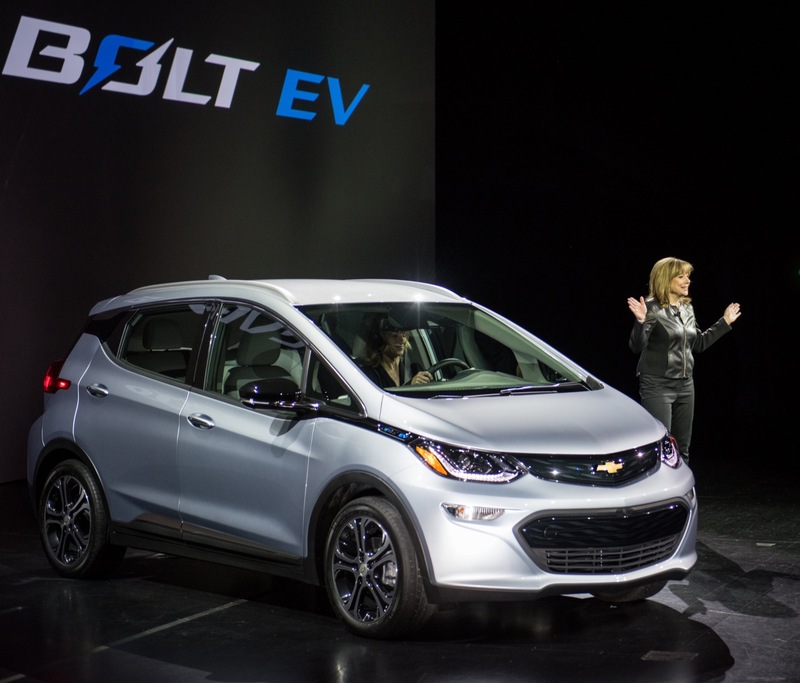 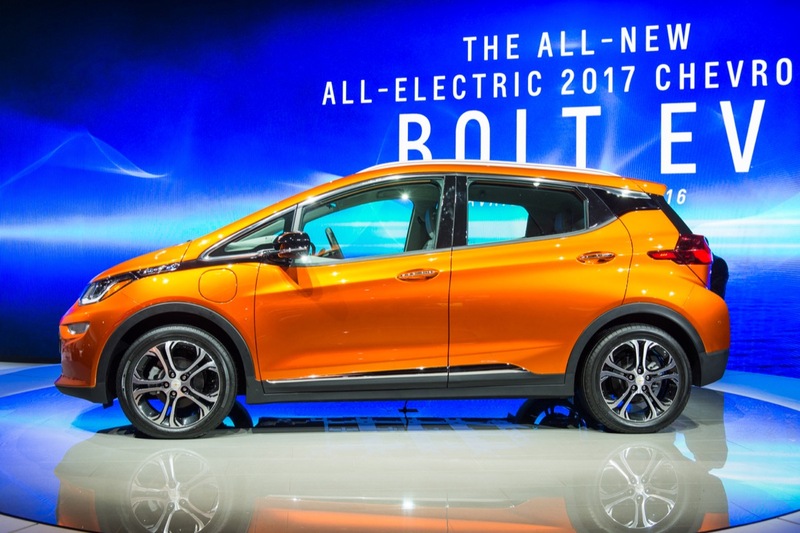 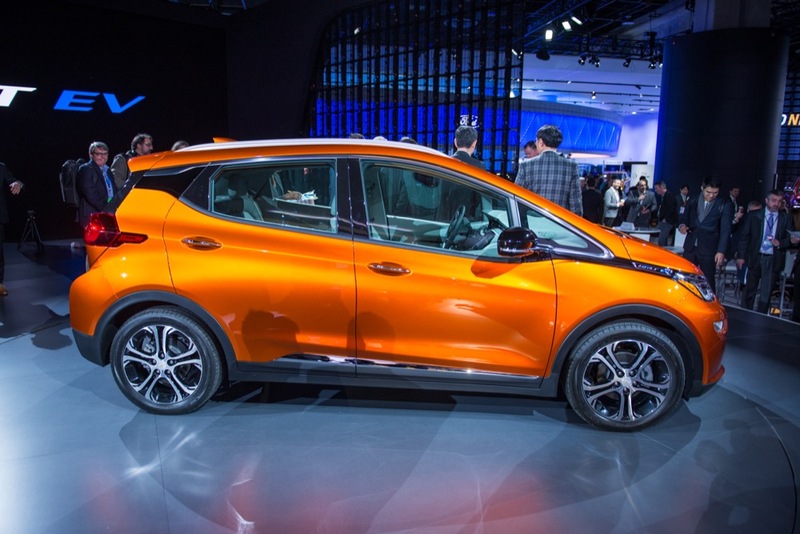 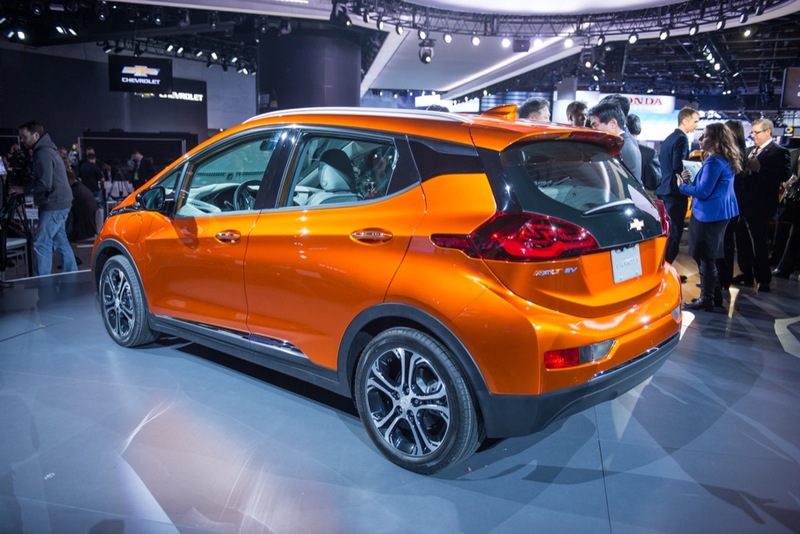 The 2017 Bolt was first shown as the Chevrolet Bolt EV Concept at the 2015 North American International Auto Show in Detroit. 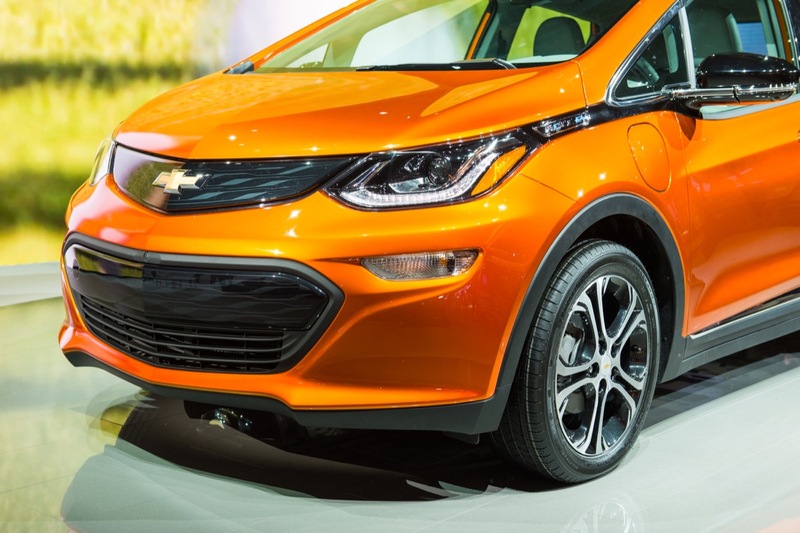 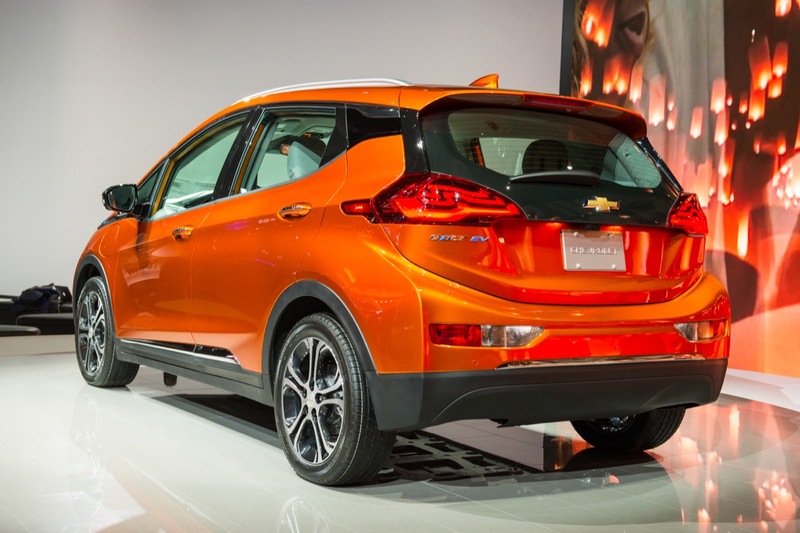 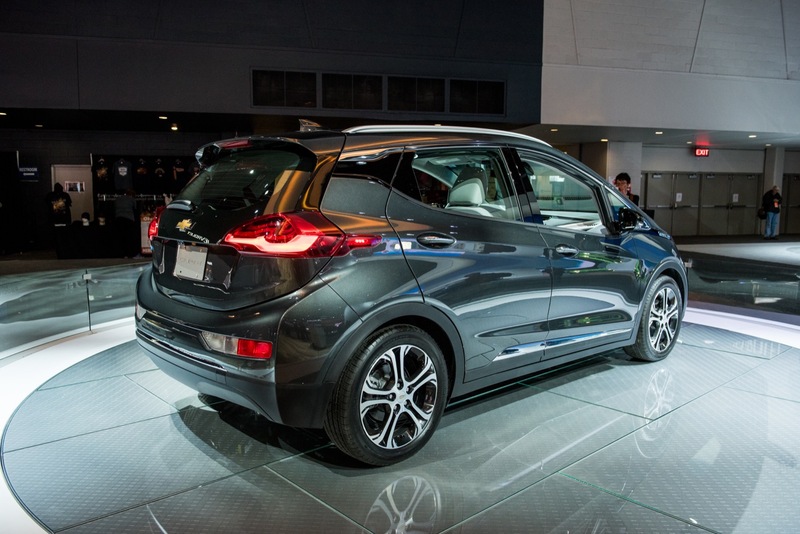 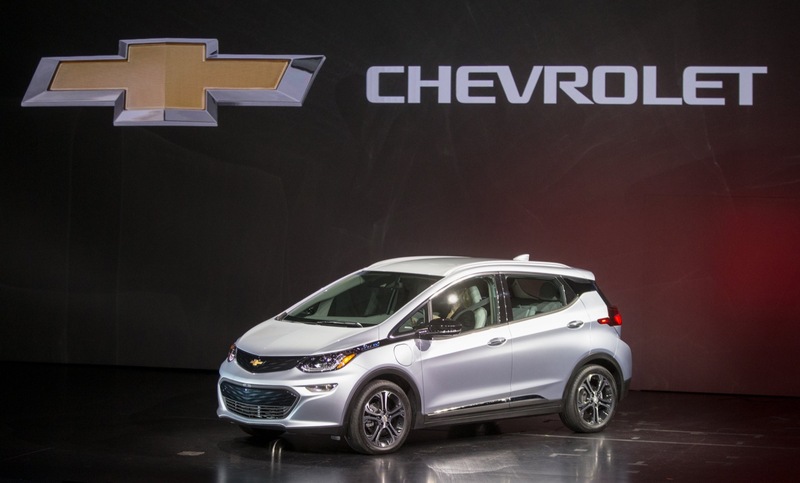 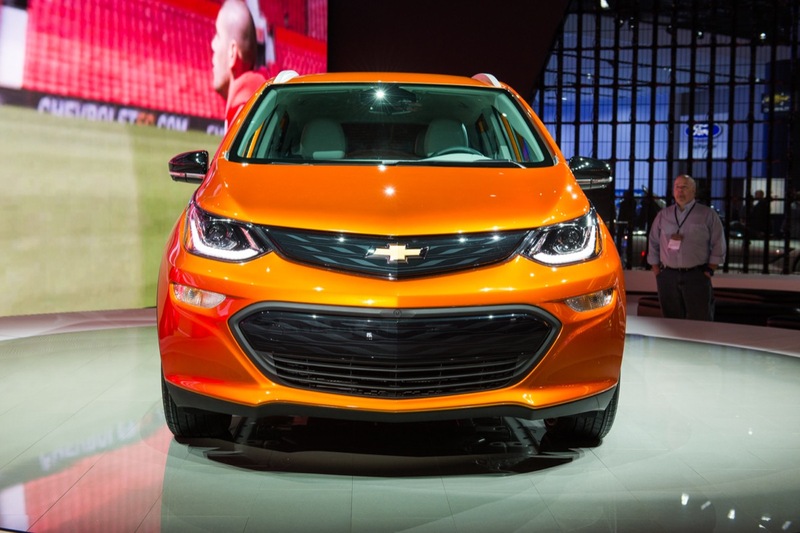 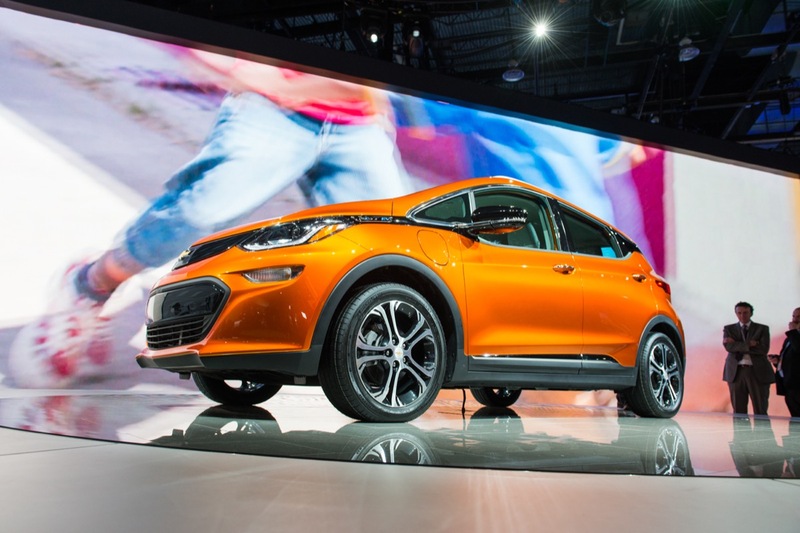 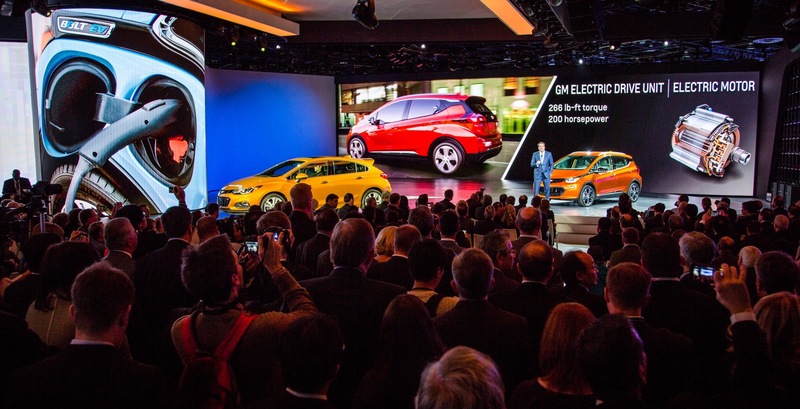 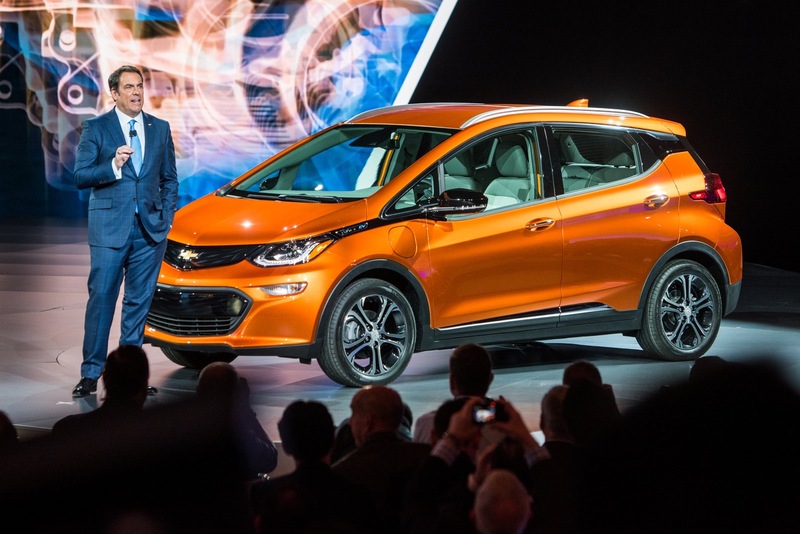 Follow this link for Chevrolet Bolt news. 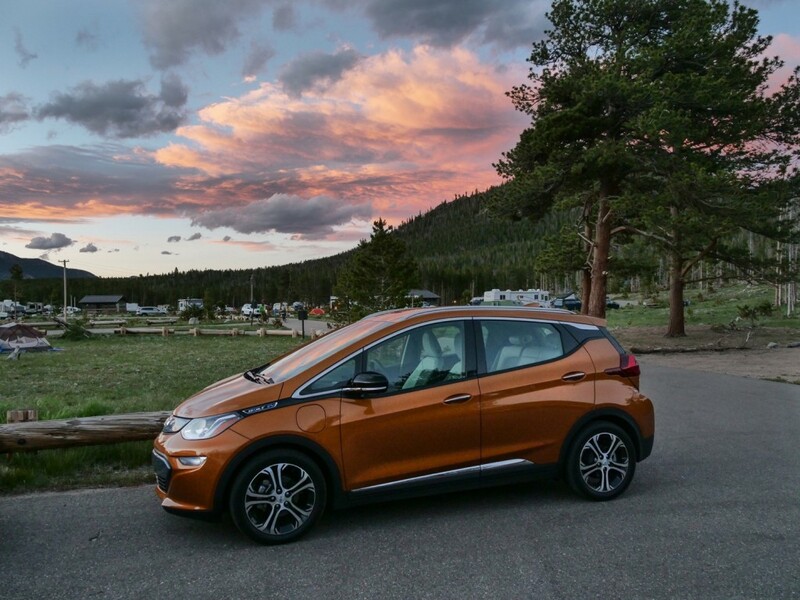 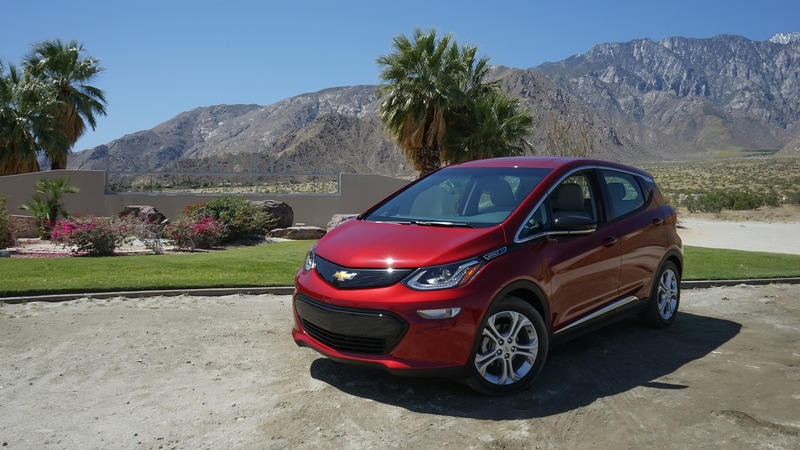 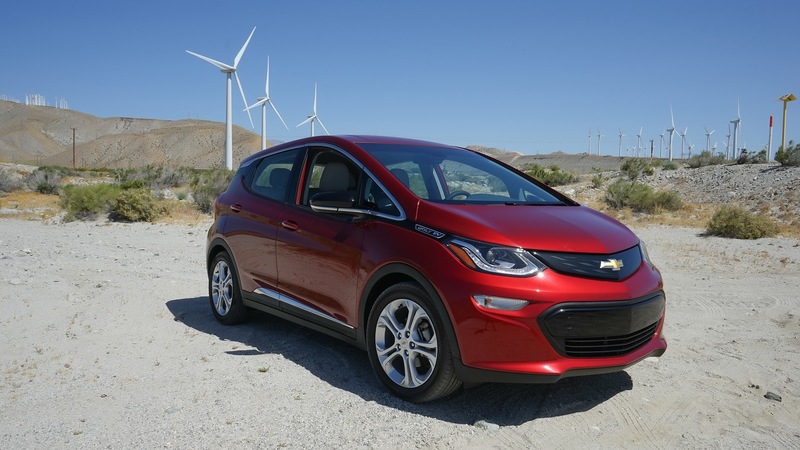 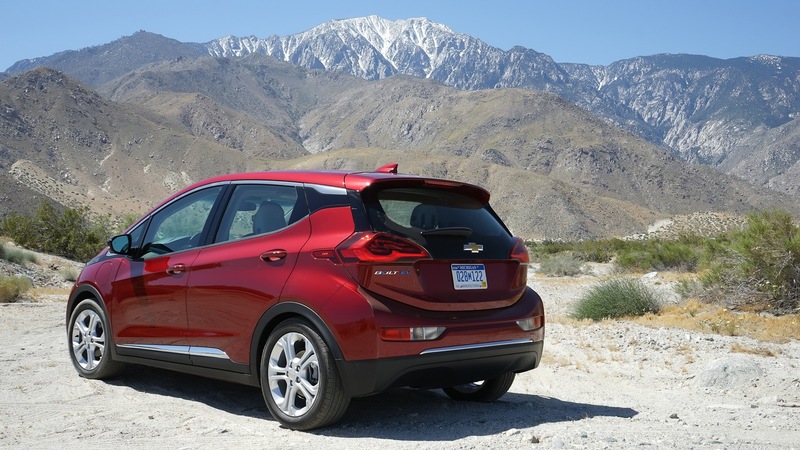 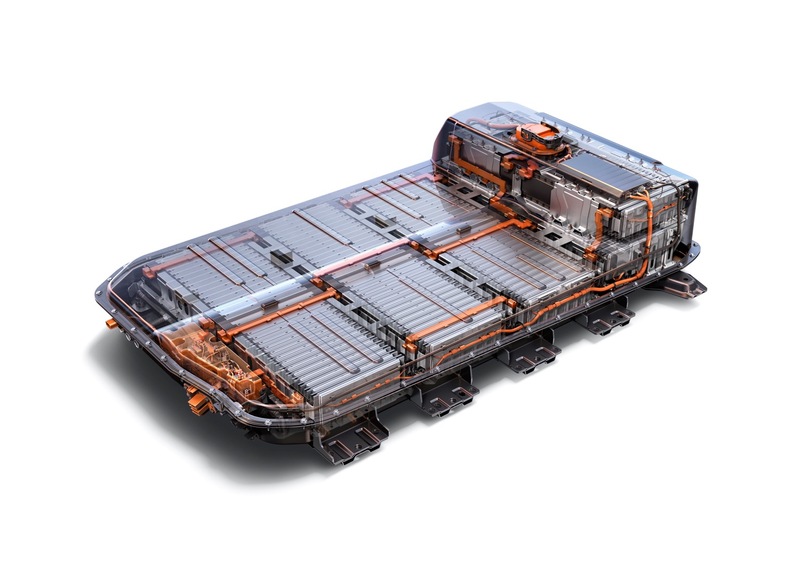 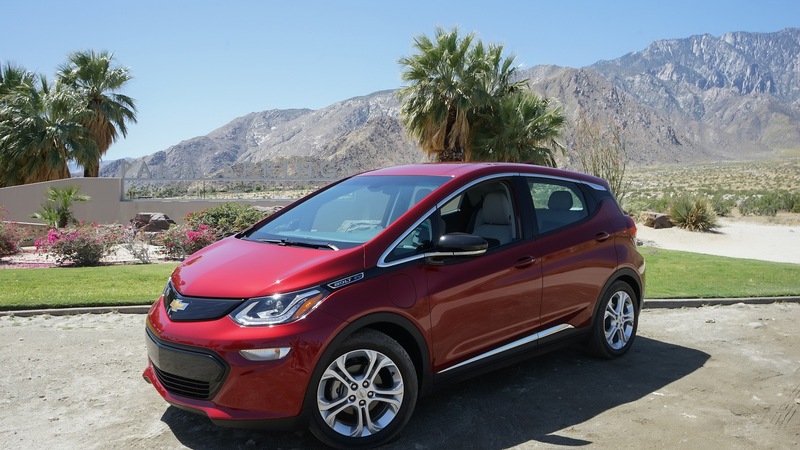 Discuss the Chevrolet Bolt EV in our Chevy forum.